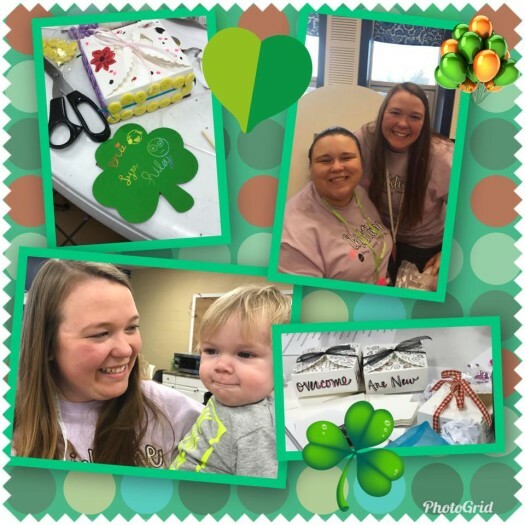 April was a lot of fun at Chicktime Indy. 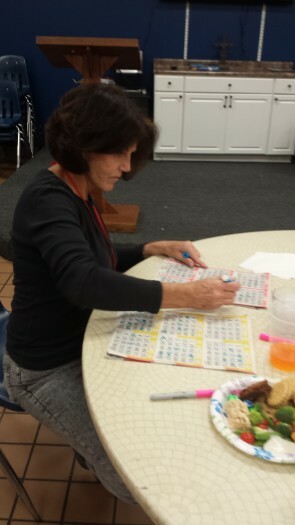 The ladies enjoyed playing bingo…. and winning prizes. 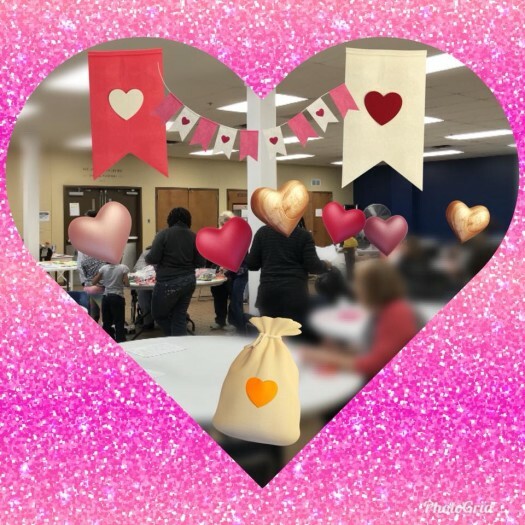 Love was in the air at our February workshop! Our January workshop was canceled due to a winter storm. Please join us in February! We will have to double up on the fun! 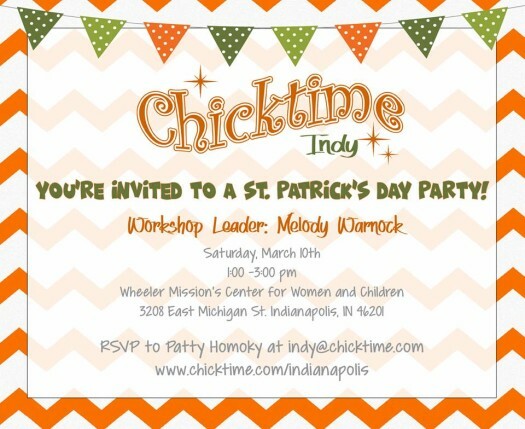 …..And just like that Chicktime Indy has a leadership team of 3!! Please welcome Jo Ella MacKool as she joins Patty Homoky and Kelley Baumgartner! 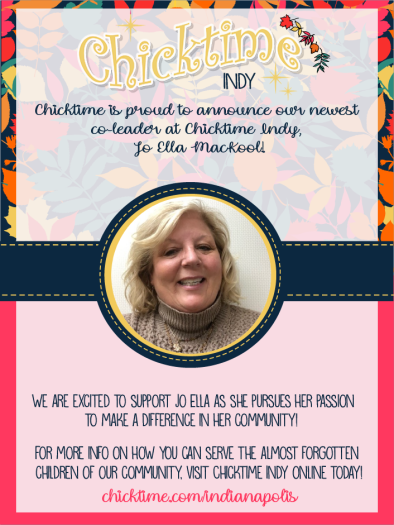 Such exciting times in Indy and we are so thrilled to have Jo Ella as part of our Chicktime family! 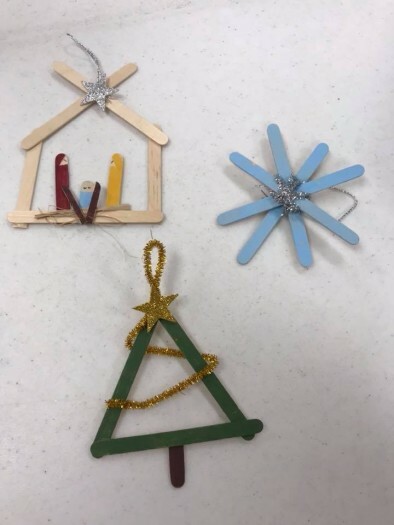 Everyone had a great time making new Christmas decorations this month! 🦌⭐️They all turned out terrific! 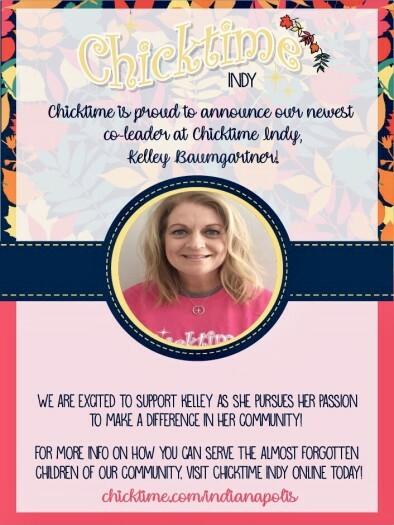 Hey Chicktime Indy~ Please help us welcome Kelley Baumgartner to the Chicktime Indy Leadership team. Kelley has been a volunteer for a while, but has such a heart for hurting women and children that she knew she needed to step up and be on the leadership team. We can’t wait to see the legacy she will leave in Indy. Thank you to everyone who joined us for Chicktime November! So much fun making Chicktime Shirts! We will be making cards next month! Come get crafty with us! Look how crafty we got!! 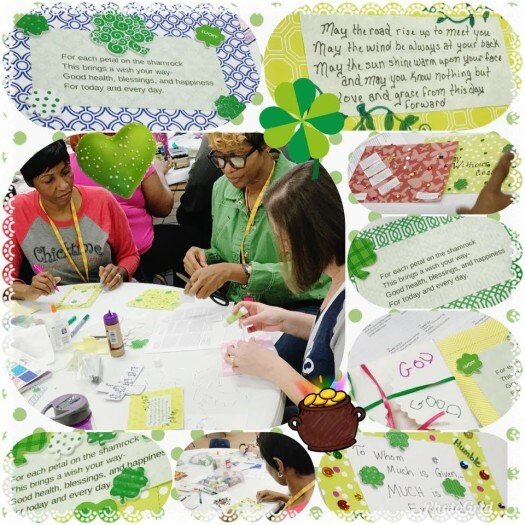 What an incredible workshop making prayer journals and just being in the moment of togetherness! Just look how beautiful they turned out! 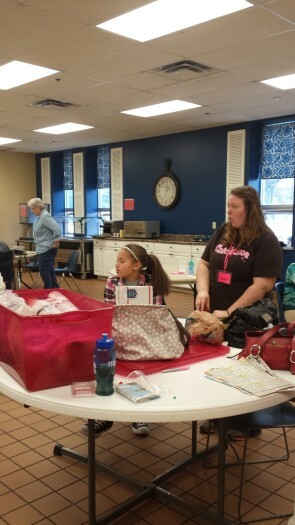 Everyone love making T-shirt tote bags this month! The boys had fun of their own playing ninjas. Thanks Heather for leading this month. Hope to see everyone next time. 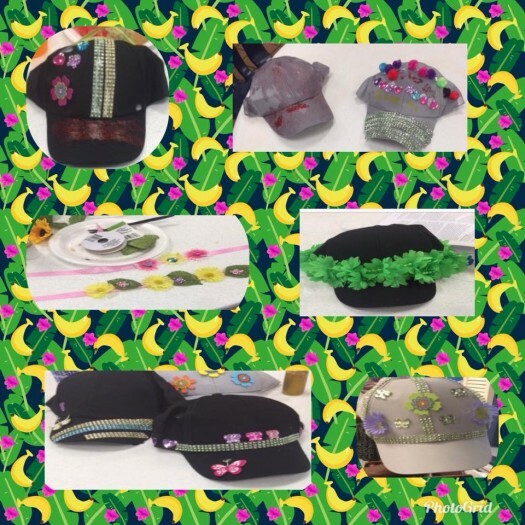 The ladies enjoyed decorating hats and even making headbands at our June workshop! Thanks to Pam for leading this fun month! You are a blessing to Chicktime and we thank you for volunteering with us! We can’t wait until next time! 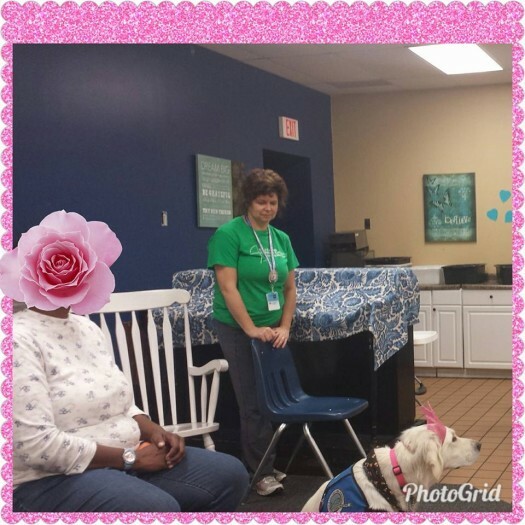 The ladies loved being pampered this month! Join us next month~ We would love to serve with you. 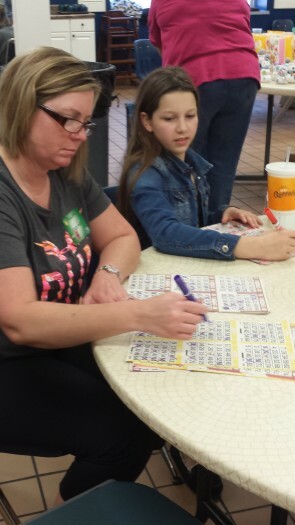 The ladies LOVED playing Bingo at Chicktime this month! And we LOVED spending time with them!!! Our March time together was the usual Chicktime FUN!! Each month we continue to get more volunteers and the atmosphere of love and connectivity is just amazing. We hope you can see how beautiful and active our workshops are and join us one month. 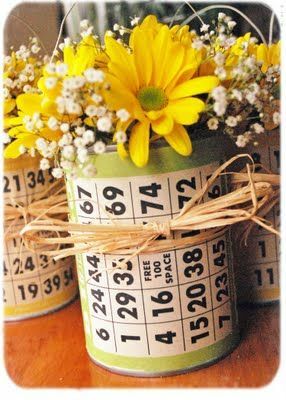 We are playing BINGO next month! Hope to see you there! 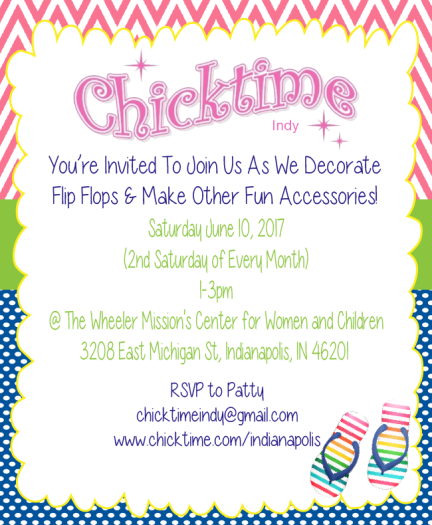 Chicktime Indy was so much fun this month! We were able to share love with the women and the Center with our tree of love and gratitude again this year and it turned out amazing!! 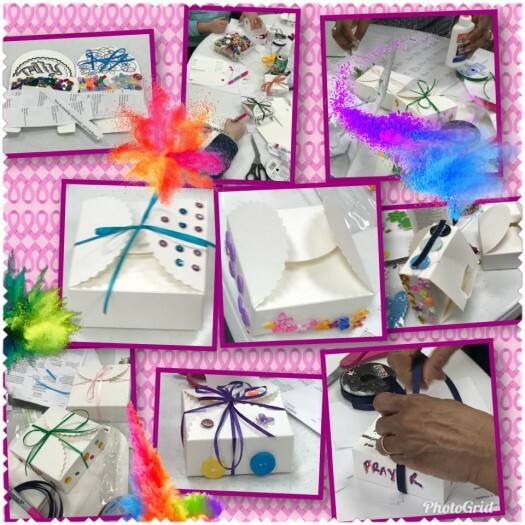 Oh what a fun workshop! 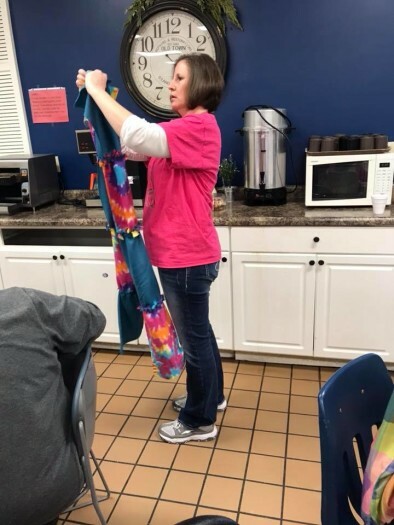 Thank you Denise for leading us in making fleece scarves and having so many great options to choose from! The girls seemed to enjoy themselves and were excited to have something to wear that they made! We all will be warm until the next time we see each other! What a glorious Chicktime December making Christmas ornaments together. It’s a beautiful thing to watch everyone get so creative. Chicktime Indy would like to take this opportunity to wish everyone a very Merry Christmas and a very Happy New Year! We are so grateful for our volunteers and we look forward to serving with you in 2018! 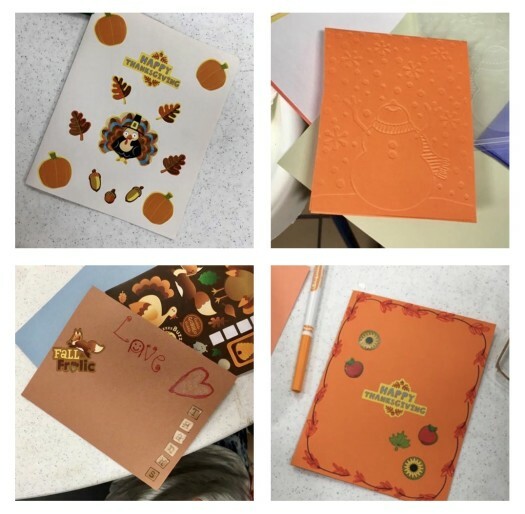 Our November workshop unleashed our creative juices as we made greeting cards! The workshop allowed us to stop and really think about this season and reflect on why we are grateful! We hope you will join us next month as we continue to celebrate with a Christmas Party! 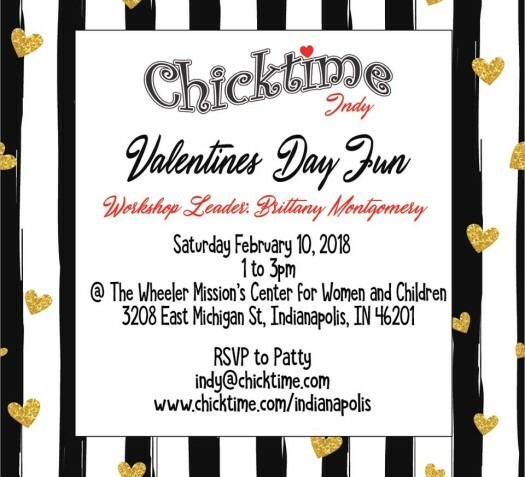 Chicktime Indy was overwhelmed by fun and love this month! Can’t you tell in these pictures? 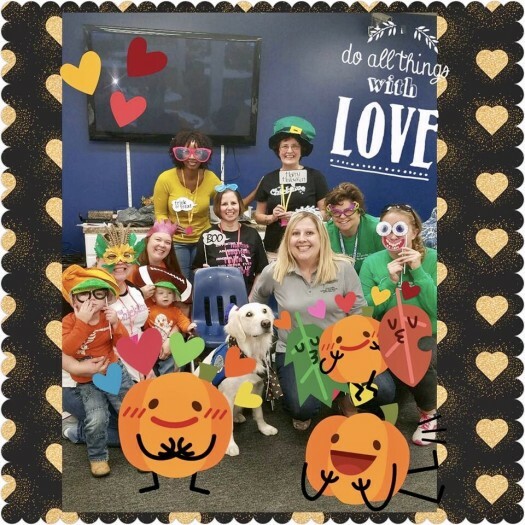 Photo booth laughs and picture frame making filled our time during our workshop….but we connected on such a deeper level as we shared love in our hearts! 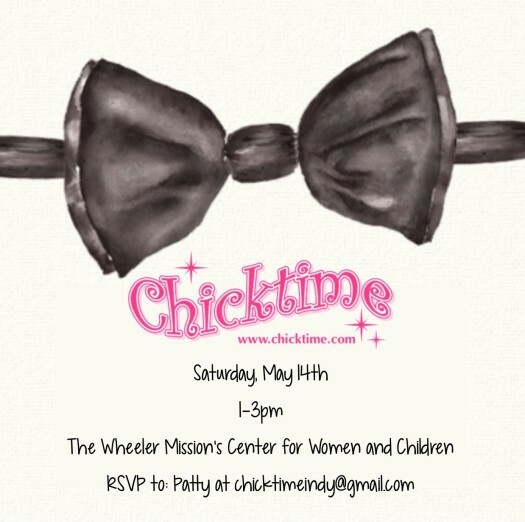 We can’t tell you enough~ Chicktime is life changing and it’s not just life changing for the people we serve! Chicktime Cincy meets Chicktime Indy!! 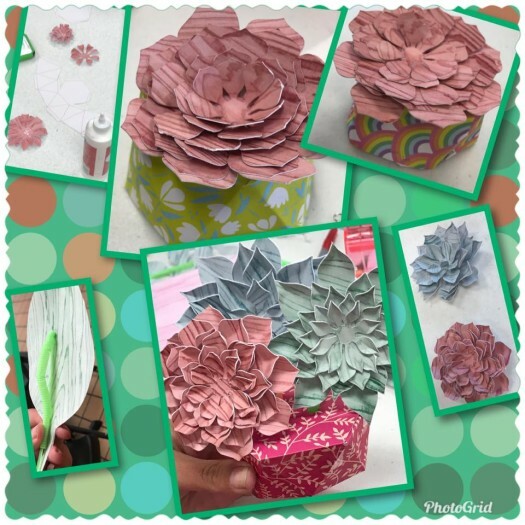 Chicktime Cincinnati chapter leader, Rosetta Keller, traveled to attend Chicktime Indy’s September workshop to get ideas from one of the craftiest people out there~Patty Homoky….who by the way is Chicktime Indy’s chapter leader! This certainly tells it like it is…..We are a family!!! 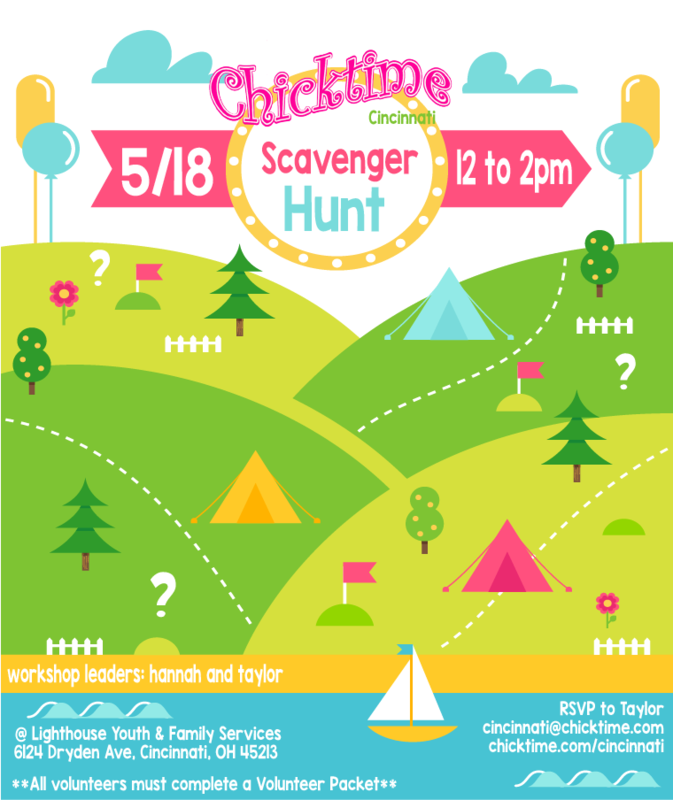 Chicktime Cincy left with new ideas and a deeper bond with Chicktime! 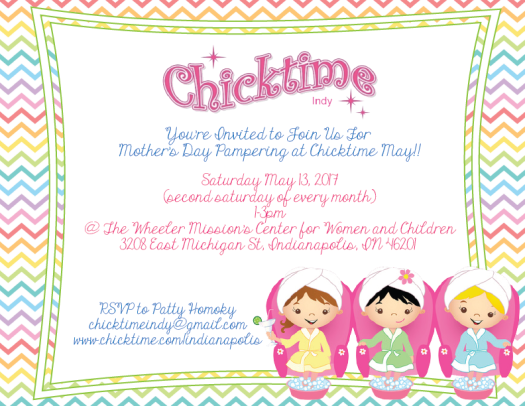 Chicktime Indy was terrific today! 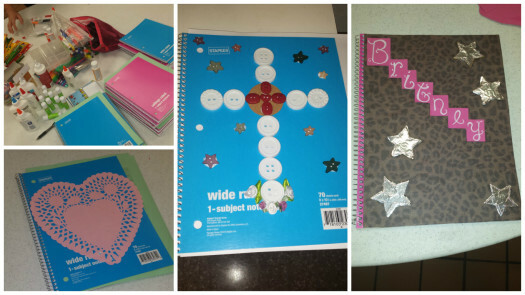 We decorated one subject notebooks and turned them into beautiful prayer journals. 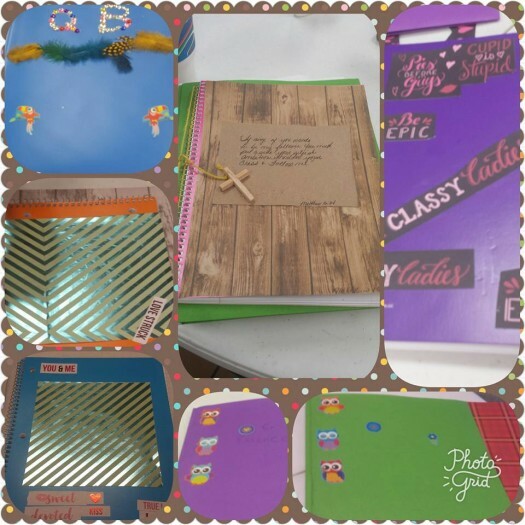 I didn’t get picture of all of the beautiful journals but here are a few for you to enjoy. ❤ ? ? 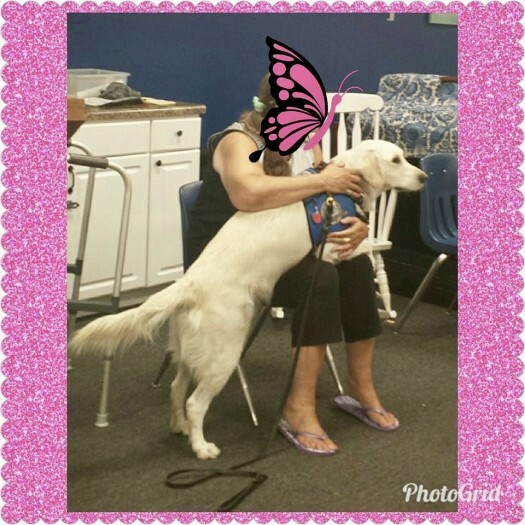 We love our Chicktime Volunteers….especially “Noami, a comfort dog that is now a regular at Chicktime Indy! It’s such a blessing to spend time with the women at Wheeler Mission Center for Women and Children! ? Especially when we get to make masterpieces like these! Put Chicktime on your calendar for September 9th now. Come join us. Chicktime July was busy! busy! BUSY!!! 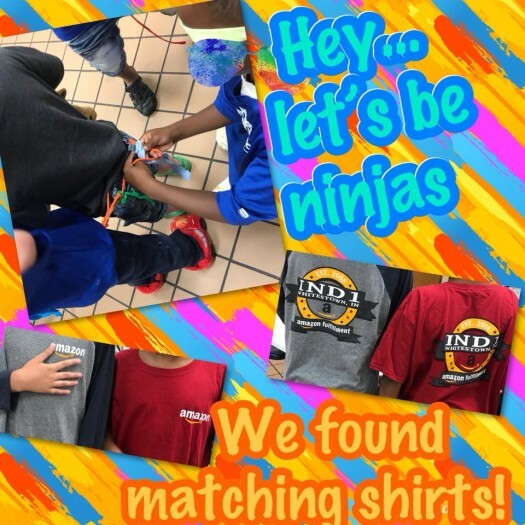 We decorated t-shirts, made bracelets AND headbands! Bringing Chicktime to the Wheeler Mission Center for Women and Children makes our hearts happy, but more than anything it brings peace and hope to the people we are serving. We had an awesome turnout for Chicktime June! 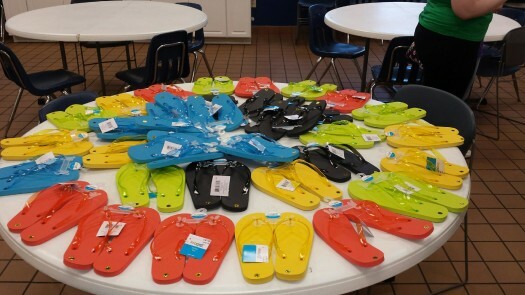 We made flip flops with the women and children of the Wheeler Mission’s Center and everyone had a blast! Once again, we have to thank our wonderful volunteers for their amazing commitment to making sure we have the most incredible snacks at Chicktime every month! 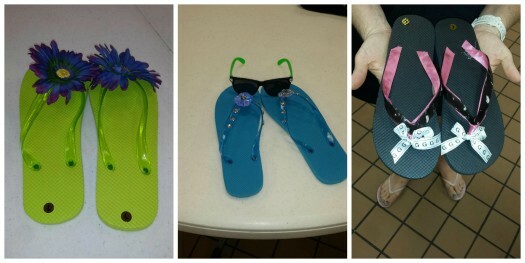 How cute are the girls flip flops!??!? 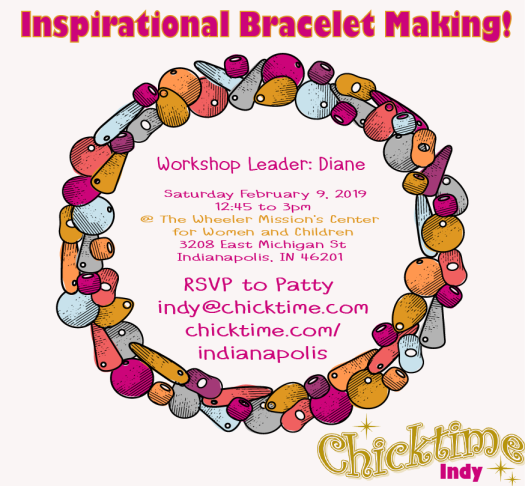 We are so blessed at Chicktime Indy and we would love for you to join us for another AMAZING Chicktime workshop next month! This month, we had a special Mother’s Day surprise for the women and children of Wheeler Mission’s Center. 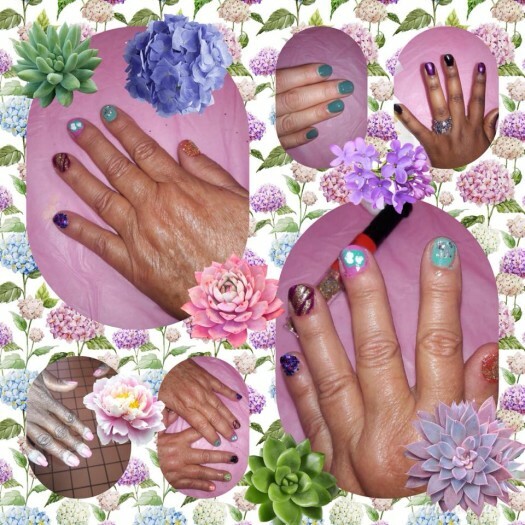 Every woman deserves to have a beautiful manicure and we had a blast getting creative with everyone! 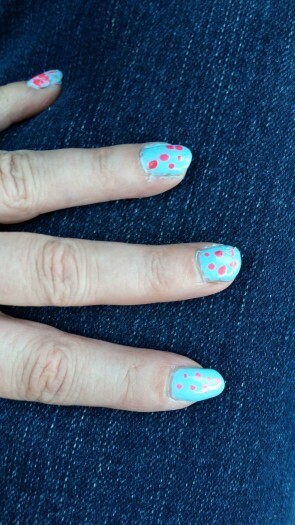 One of our girls was a STAR manicurists and it was so fun to watch her shine! A special thank you to our volunteers that continue to provide some of the most delicious snacks and food for our Chicktime workshops! This month, they topped themselves when they showed up with chicken salad, spinach salad, and some of the most amazing deserts we have ever tasted! 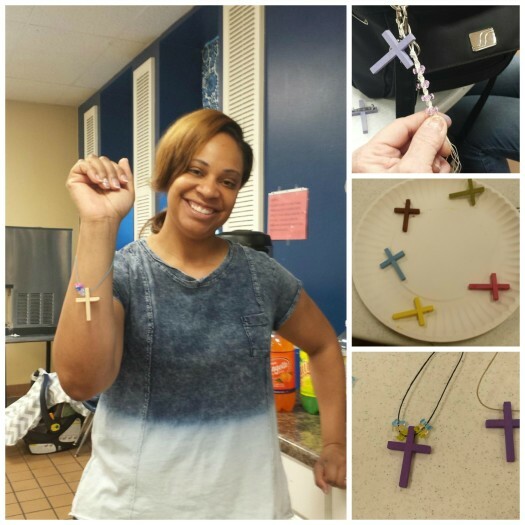 This month, using plain wooden crosses, the the women were able to decorate and make a necklace and a pin to wear. They did an amazing job and they turned out wonderfully! 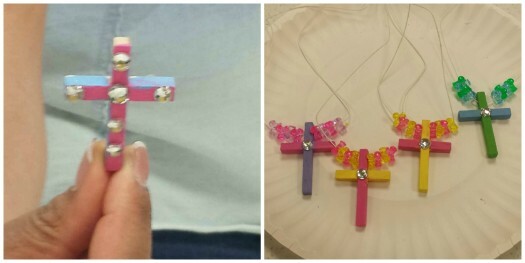 This month, we will be making cross pins and necklaces. 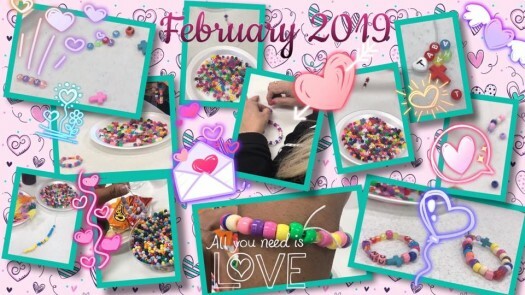 We hope you will join us for this fun craft! This month, we played bingo with the women. There was a large selection of prizes for them to choose from and at the end everyone got a prize! We had an awesome volunteer turnout for our February event, too bad we were up against great weather and a fashion show. Resident turnout was low but we still managed to create a beautiful tree of love & gratitude! 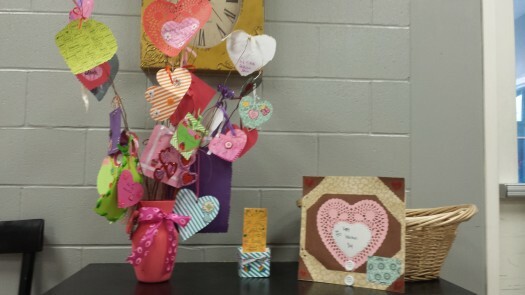 Some of the kids also made adorable Valentine’s! Check out the pics and mark your calendar now for our March event, March 11th! Thank you to all who came out to our January event! It was an awesome afternoon! 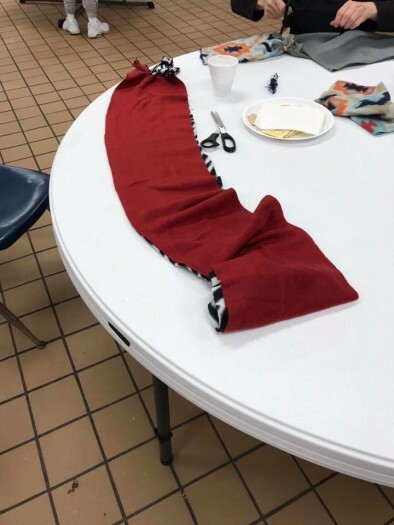 The women made beautiful no-sew scarves and got to enjoy an amazing food spread! 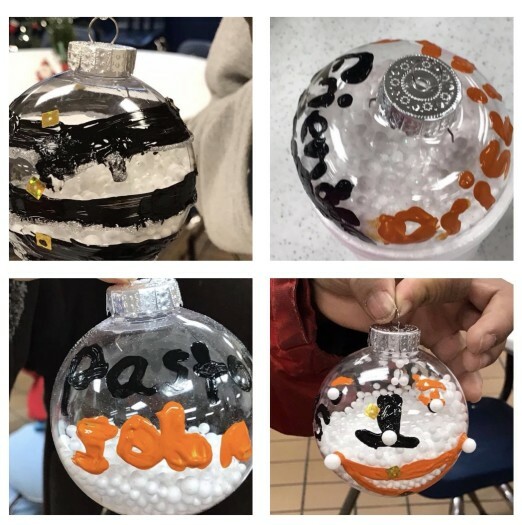 Check out a few of the finished products! We had a mighty crew in August and had fun making mini chalkboards!! Our guest attendance was lower than usual due to a field trip but the ladies expressed how glad they were that we visited today!! Thank you to everyone who attended Chicktime August and we can’t wait to see you again soon! 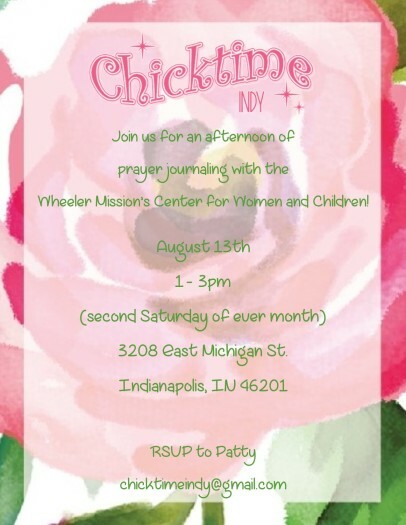 Thank you to everyone who attended Chicktime August @ The Wheeler Mission’s Center for Women and Children! We made prayer journals. The women seemed to really enjoy it. As always they were very creative! 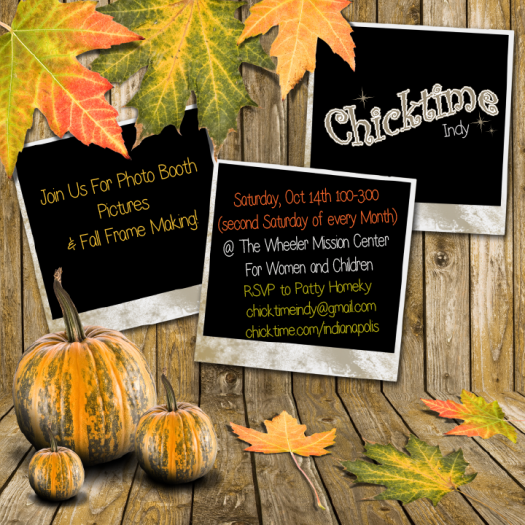 We can’t wait for Chicktime September and we hope you will join us! 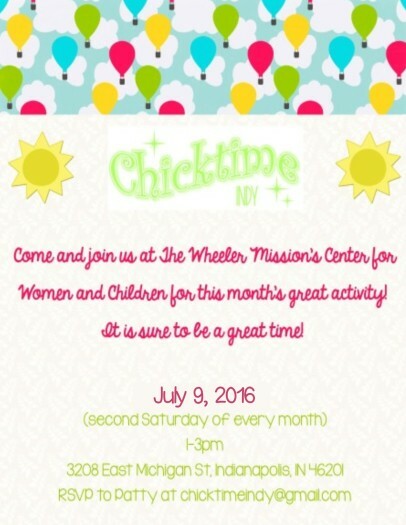 Come and join us at The Wheeler Mission’s Center for Women and Children for this month’s great activity! 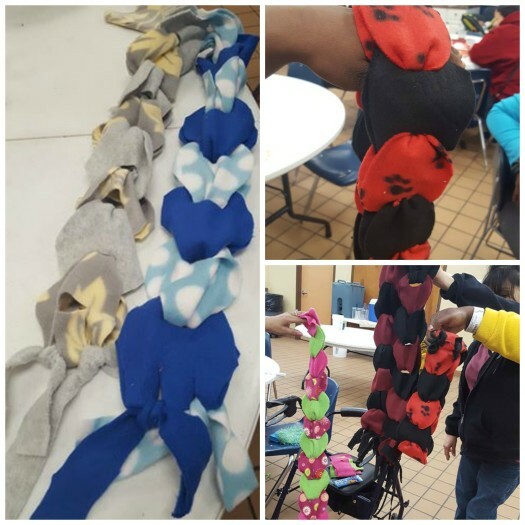 This month we are learning to make our own hair accessories out of various types of fabrics! 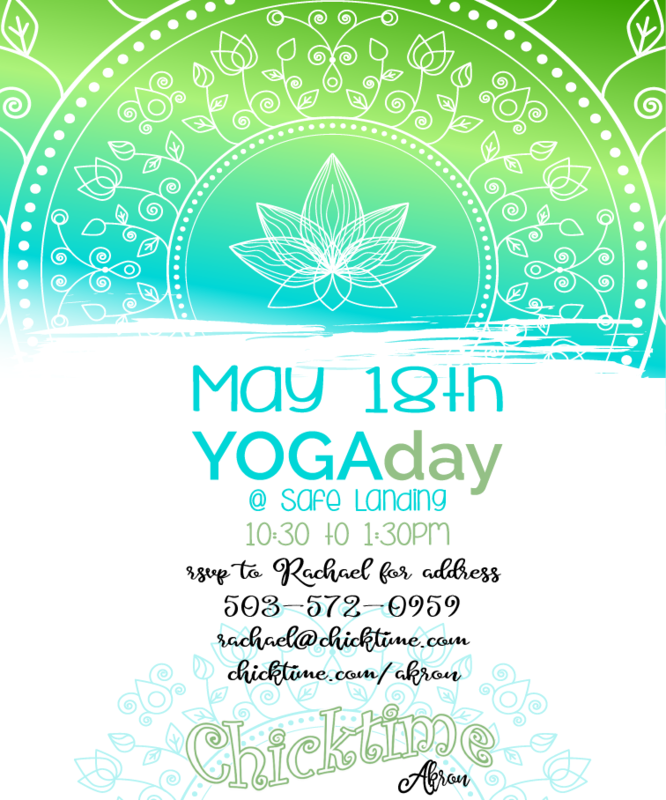 It’s sure to be a wonderful afternoon and we would love to have you! It is always interesting when a new volunteer comes in for the first time. We always introduce ourselves and they ask what they can do. If there is not a specific task to be done I tell the new volunteer that they should talk and help the women if they need it. Sometimes I get a wide eyed look that is really saying “Seriously, that is what I came here to do????”. They then go about maybe talking to a few women but staying close to the other volunteers who are normally in a small group somewhere in the room. The other volunteers may have a specific task they are doing in order to help the women or they may be helping a woman who asked for their help with the activity. When our time at The Center is done we always try to talk to the new volunteers because we want them to come back. Normally they say yes we will be back and we may not ever see them again. I tell you all of this not to make our volunteers feel bad or guilty in any way but so you can get a picture of our time at The Center. I often fall into the trap of staying close to the other volunteers as well or talking to the women that have been at The Center for longer periods of time that I have gotten to know. 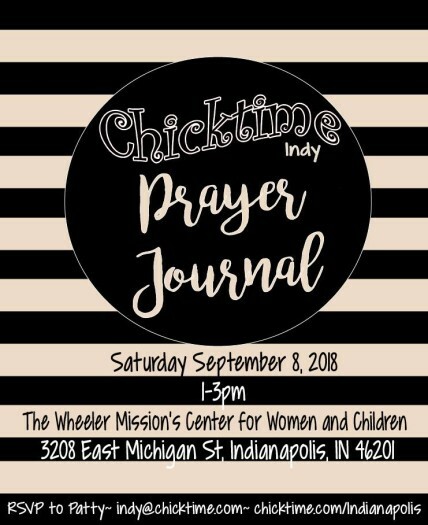 I was not at Chicktime Indy in September. I knew what the activity was and I asked for pictures and about how it went. When you aren’t there a month or two the next time you come there are new faces but volunteers and women at The Center. I always try to talk to any volunteers that I haven’t seen before (because we want them to come back) and I say hi and help the women that ask for my help. Then I fall into my trap, some of the volunteers I haven’t seen for a while and we might spend some time catching up and before you know it, it is time to go. I can’t tell you why but this month was different for me. We were making greeting cards. We set up a table with the blank cards, another with the embellishments, one with all the scrap book paper, and another with the ink stamps and our new toy…. The embossing machine. Everyone loved the embossing machine, volunteers and residents a like. Think of the possibilities of what we could make to add to the cards! We were embossing EVERYTHING LOL! I noticed a lot of new faces among the residents. I said hi and caught up a bit with the ladies that I knew but something compelled me to talk to this other table of women. Each of the women were so sweet and yet something told me to ask more questions. 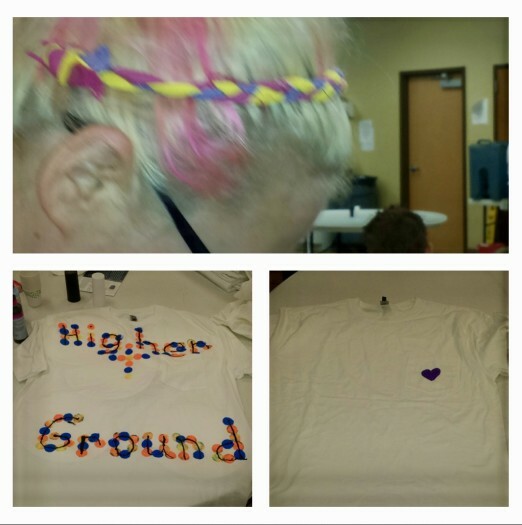 The women were new to The Higher Ground Program. That means that they are there for nine months and I’m sure for them that seems like forever. In the beginning of the program they are not allowed to leave the building, they get limited visits (if any) and they know they need to focus on why they are there. Can you imagine signing up for something knowing that you won’t get to see or really talk to your friends or family for nine months? Think about how hard that would be! These women are courageous. They know why they are signing up for this and they want to make that change so much that they are willing to give up nine months of everyday life to do it. This month I took time and really talked to these women and listened to them. I talked to them about how wonderful the program is and that I was so happy for them. Then they talked to me about their fears and worries of what they are facing right now. I have so much respect for what they are doing for themselves and their families by committing to complete this program. They each know that in the end it will be worth it but the nine months ahead are not going to be easy. One of the women said to me just how much it meant that we come and do different activities and talk to them every month. She said that it really helps them to make it through since they are not allowed to leave. 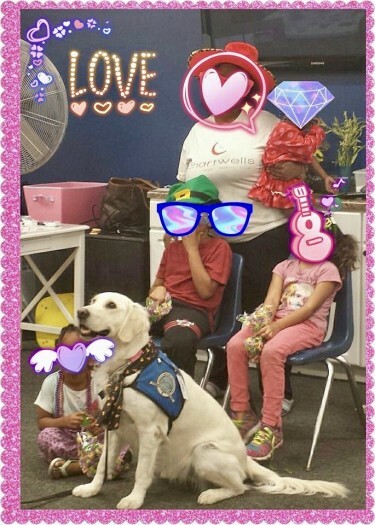 This is why I volunteer with Chicktime! The women of Chicktime are making a huge difference in the lives of the women and children we serve. It may not always be something that we can see but every now and then we can or we may hear something amazing from someone we serve. Bust out of your shell and your comfort zone, spend the time talking to the women and children we serve because you never know what you might hear or learn. Chicktime not only works to heal those that we serve but a lot of the time we, as volunteers, ending up healing as well. Thank you Brenda for taking the lead this month. The women had adorable mini chalkboards. They had a great time and all the chalkboards turned out wonderfully! Thank you Brenda!! Heather took the lead this month. She helped the women make prayer journals. 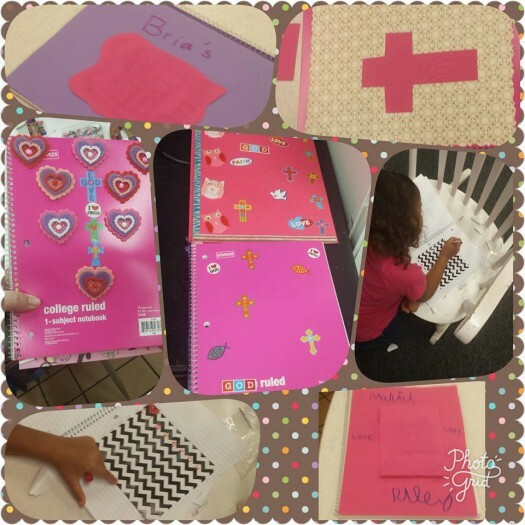 They were able to decorate their new journal however they wanted. They also got a few pages of scripture that may just inspire them on diffenent days to get going in their new journals! Thank you Heather!!! This month Angie and Trish were our fearless Chick Leaders. They did a great job showing the women how to make necklaces out of washers. The women loved their new adorable necklaces!! They also made some cute art work with glue and watercolors. The artwork of fireworks turned out wonderfully!! Thank you ladies for showing the women a great time this month!! This month the women took a little time to discover different ways to relax and distress. There were adorable adult coloring book pages. The women also enjoyed some DIY spa treatments. They had honey facials, honey and syrup lip scrub, and sugar scrub. They were able to add essential oils to the sugar scrub to make it their own. Everyone had a great time and left feeling a little more relaxed. Chicktime Indy spent the month of May getting creative! 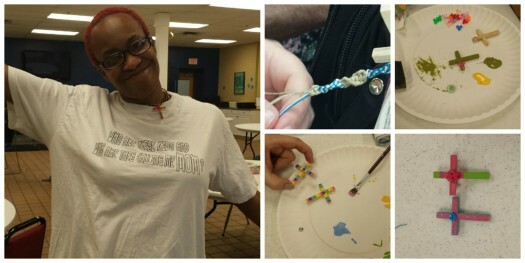 This month we made headbands and bracelets out of old shirts. The ladies took the strips of shirts and either braided them, wrapped them around bangle bracelets, or learned how to finger knit. 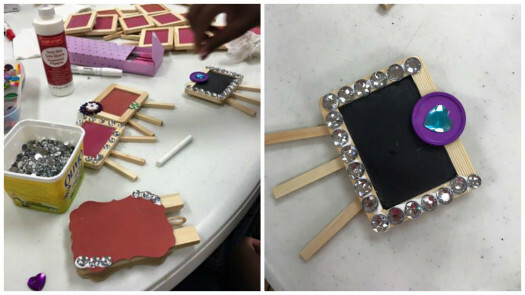 They had a great time creating new accessories to wear! A huge thank you to Donna for being our Chick Leader this month! 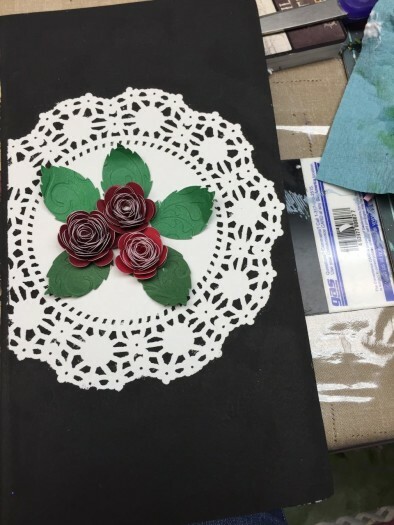 All the women had a ton of fun making beautiful journals. This month was so much fun! Trudy was our Chick Leader this month. 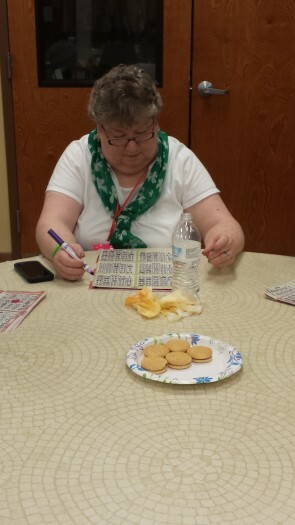 Thanks to Trudy the women got to enjoy playing bingo and getting some fun prizes! Everyone had a great time! I can’t wait to see everyone next month. This month was filled with love and a lot of sweet treats! 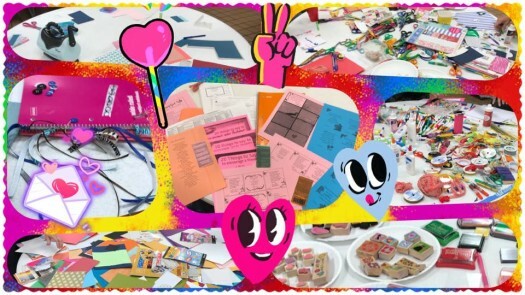 The women made some amazing Valentines to fill The Chicktime Love & Gratitude. This is a tree that we make and leave in the lobby at The Center. 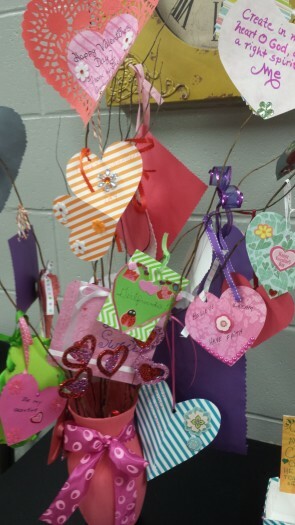 Each woman is asked to make at least one Valentine for the tree and can make as many more as they like. The tree is left at The Center so that every woman can feel loved at this time of year. This month Carol was our Chick Leader. 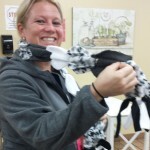 The ladies had the opportunity to make some really cute fleece scarves! Each scarf was very unique and everyone had a great time making them. 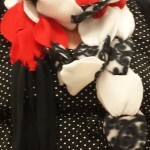 I know these scarves will come in handy now that the cold weather is here… brrrr. 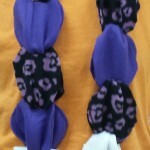 Check out some of the scarves below in the pictures below…. 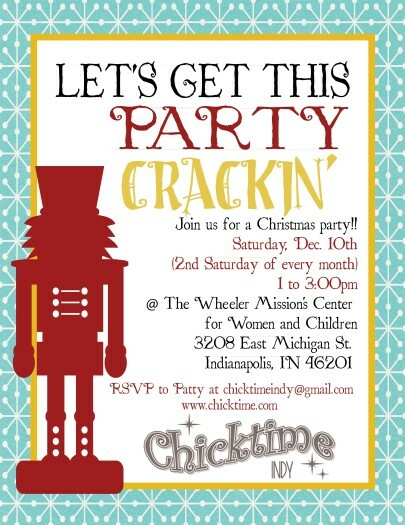 December is always a special time of year and Chicktime Indy made sure this month was special for the women! 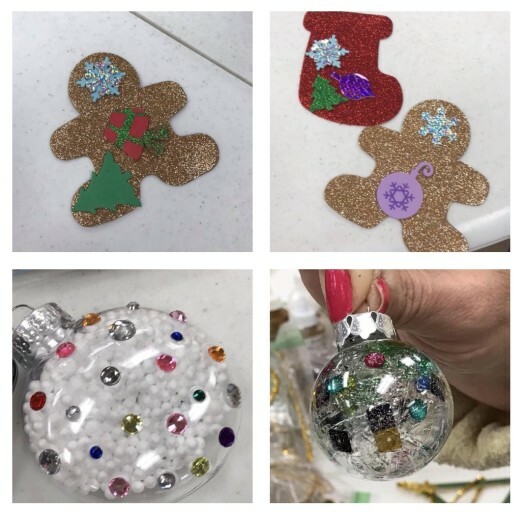 This month the ladies got to decorate some holiday sugar cookies, make some beautiful poinsettia pins, and make adorable ribbon Christmas tree ornaments. They decorated a small Christmas tree, that we left in the lobby of the Center, with these adorable ornaments! Thank you to all the repeat volunteers, we couldn’t do this without you! And a special thanks to our new volunteers! I know that the women and volunteers loved getting to know all of you! October was a ton of fun! Brenda was our fearless Chick Leader this month. 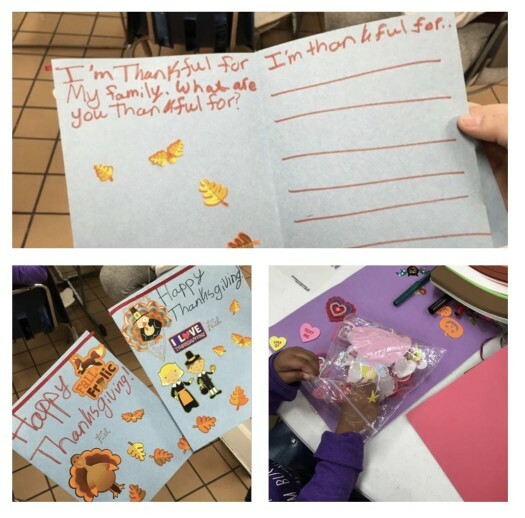 She showed the women how to make holiday cards for the upcoming holiday season. The women are so creative and made some beautiful cards! We also had some great new volunteers! I hope our new volunteers loved the activity and time with the women that they keep coming back! This was a great month! We took picture frames and made them into memo boards. The women got to decorate the frames with buttons, bows, flowers, ribbons, etc. and they loved it! They turned out beautifully! This month Patty was our Chick Leader. 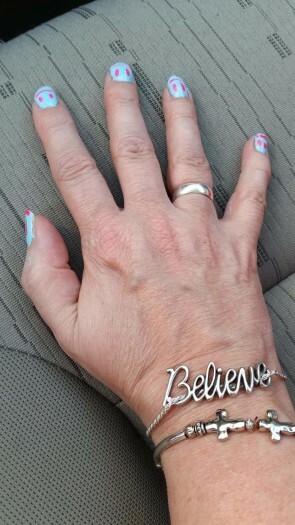 She showed the women new ways to display their favorite scripture. We made scripture cards. The women were as always very creative and they are always inspiring. 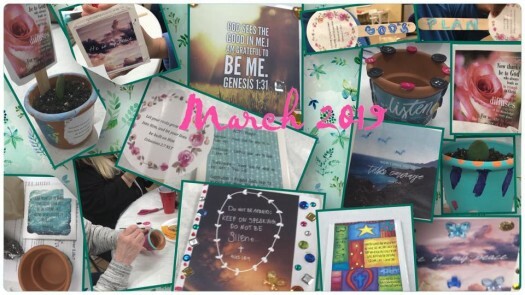 They not only made scripture cards for themselves but also to share with other women that may just need a bit of encouragment. Thank you Patty for being our Chick Leader this month. Carol was our Chick Leader this month. She did a wonderful job planning out her activity. Carol is a very crafty person and under her guidence we decorated drink jars. We turned these drink jars into flower vases. We then made paper flowers to put inside our vases. These flowers and vases turned out amazing! The women absolutly loved making these and they are so creative. You would not believe the things they do when presented with a craft. They just take it to the next level! Thank you Carol for leading such a wonderful and beautiful activity. A big thanks to Dawn for being our Chick Leader this month. 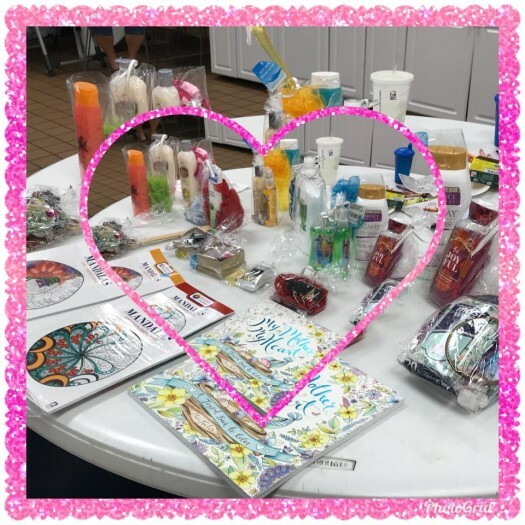 The women loved playing bingo and getting a chance to win some great prizes! I also want to thank all of our volunteers who come month after month. 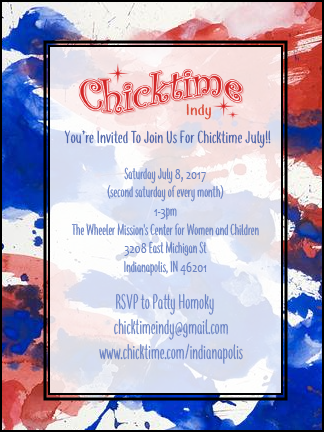 I know that life gets busy and you can’t always make it every month but without you and your support we would not be able to make Chicktime Indy happen! This month Rebecca and Rachel were our fearless Chick Leaders. They brought in t-shirts and paint so that all the women could decorate their own t-shirt. The women loved doing this activity! No two shirts looked the same but they all looked amazing! Thank you to Rebecca and Rachel for a wonderful activity! 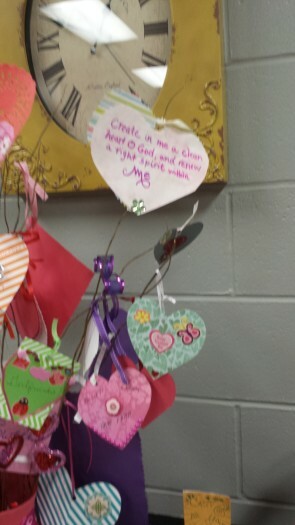 This month we made Valentines for our Tree of Love and Gratitude (that ended up being a basket with some fun Valentines balloons attached. We left the basket in the lobby filled with Valentines so that any woman at the Center could pick one up and feel loved! 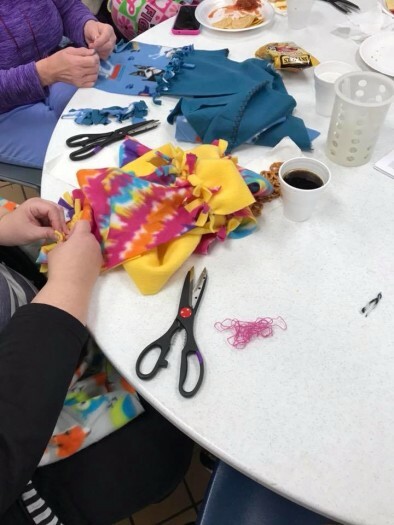 This month Carol took the lead and showed the women how to make beautiful fleece scarves. The women love to create new items for themselves and always do an amazing job! Thank you Carol! December was a crazy month for us lol. We decided to try to host a Secret Santa Shop for the women. Everyone pitched in and bought items for the women to choose from. We had gifts that they could pick out for their children and grandchildren and also items just for the women. 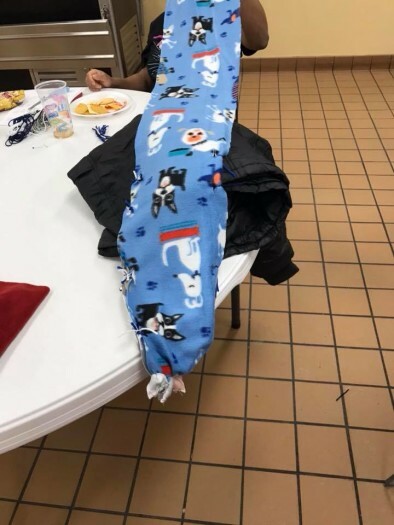 After the women selected their items they were able to go to the gift wrapping station and wrap up the gifts that they picked. This really meant a lot to all of the women at the Center. We hope to try and do this again next year. This month we made holdiday cards with the women. 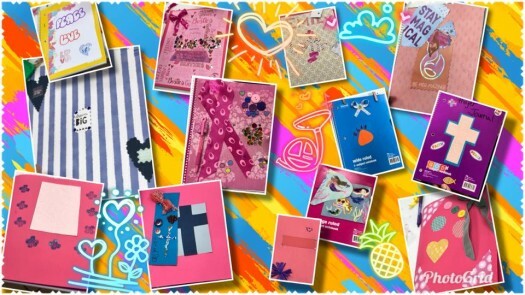 It is always fun to see what different types of cards the women create. Thank you to Brenda for leading this month! 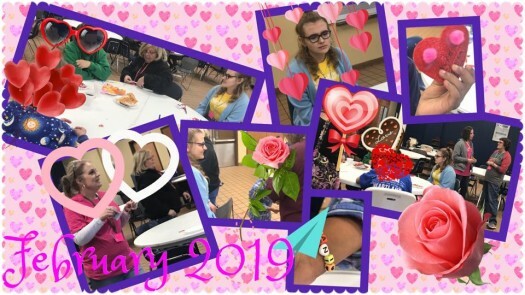 This month a group of women led Chicktime! Together they put on a pretty interesting mini fall carnival. There were many games for the women and children to play that included: Bean Bag Toss, Putt Putt, Ping Pong Toss, Hut Hut Hike and Junk in the Trunk. And of course there were tons of fun prizes for all the games! 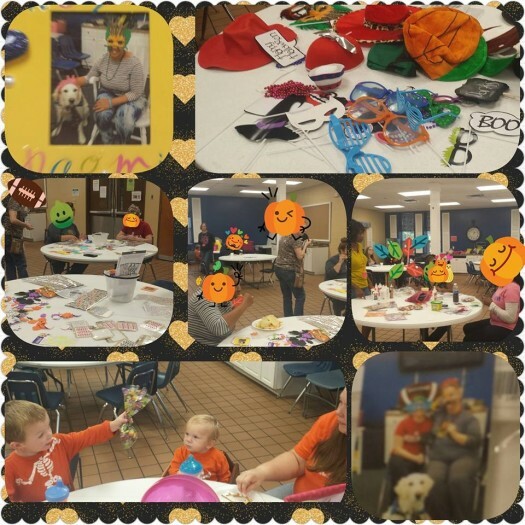 They also got to decorate hair bands, decorate pumpkins, and make their own snack mix. I know everyone had a great time. Thank you to everyone for all your hard work! 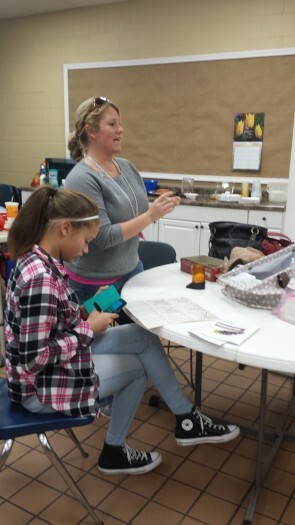 This month we had a wonderful new volunteer as our Chick Leader! Dawn currently sells Beauty Control by Tupperware (most of us weren’t even aware that Tupperware had a beauty line!) 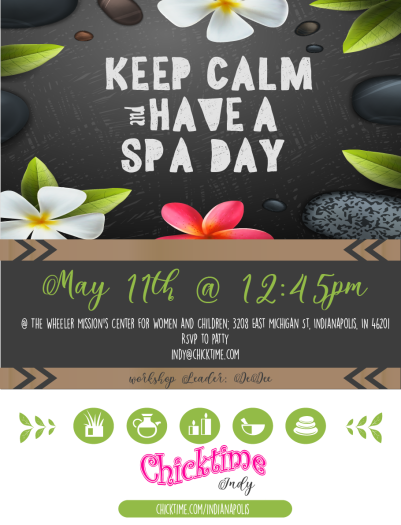 She was graceful enough to come in and offer a day of spa treatments and relaxation for the women. She also brought in a ton of beauty products for the women to take with them! I know that the women felt very special all because of Dawn and the wonderful day she provided for them! Thank you so much to Dawn and we hope to continue to see you every month! 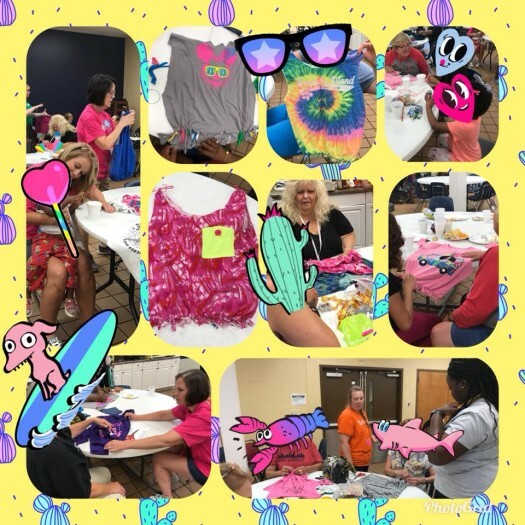 This month we once again brought back a favorite activity of the women; we made t-shirt tote bags! This is an activity that the women always love to do. Each woman gets to make and then decorate a tote bag out of a t-shirt. 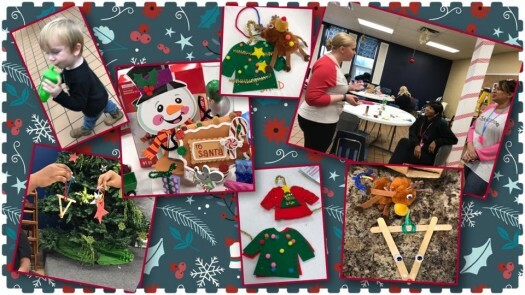 Every year the women at the Center amaze me with just how creative they are! The can take a t-shirt and make it into something absolutely beautiful! 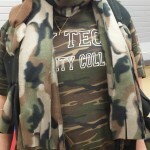 We did add something a little different this year and the women also made scarves out of old t-shirts. 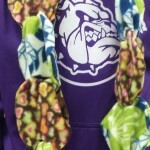 The scarves also turned out amazing! 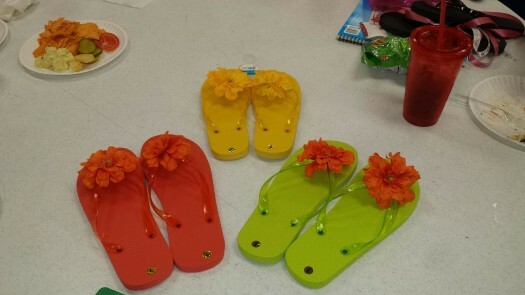 This month we decorated flip flops and had a luau! The women are as always more creative than we could ever dream up and took their flip flops to levels we never would have imagined! The women loved the special gifts dropped off by Rebecca even though she couldn’t make it. 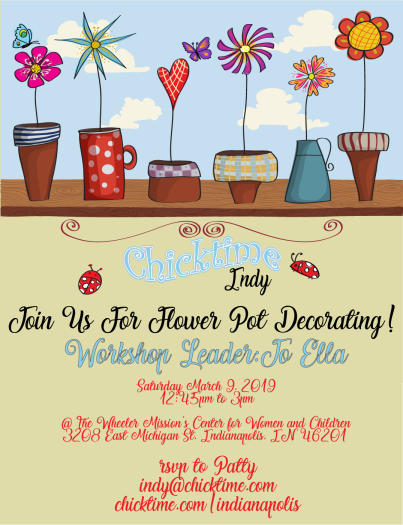 We again had some new wonderful volunteers and are so excited that they want to continue to come and help out however they can with Chicktime Indy! Thank you to all of our wonderful volunteers, we couldn’t continue to do the wonderful things we do without you!. 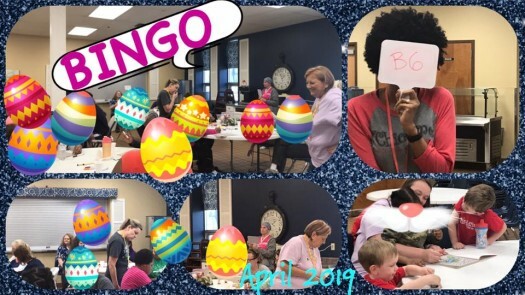 At the women’s request this month we played bingo! Everyone had a wonderful time and all the women had the opportunity to get some wonderful prizes! Thank you Dawn for organizing this month and to both Dawn and Rebecca for getting such wonderful prizes! We had a wonderful time in May thanks to Brenda and the great day she planned for us. This month we planted in beautiful flowers in the pots that we decorated! Thank you to Brenda and Karen for getting everything together for this month and also to Rebecca for suppling the wonderful snacks! 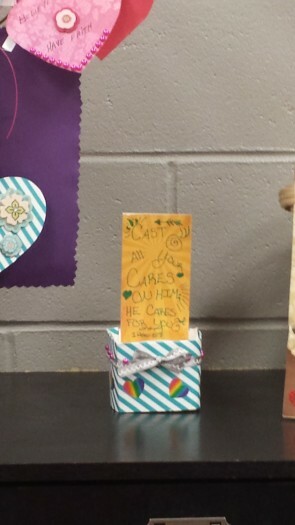 We had a great time this month doing Easter crafts! This month we painted Easter egg, cross, and flower salt dough ornaments. We also decoupaged eggs to look like Faberge eggs. 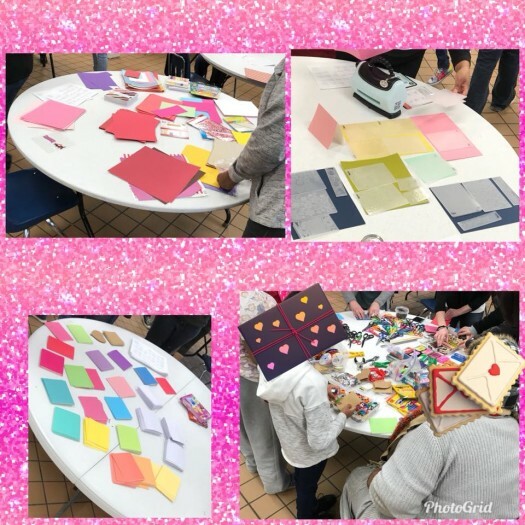 The women had a great time getting creative with these crafts! Thank you to all of our volunteers for all of your wonderful help! We are so excited to see new volunteers every month and to see new volunteers returning! Brenda was our fearless Chick leader this month! She did a wonderful job building a photo booth! We all had a great time taking fun photos in the booth. Then after Brenda printed out the photos we got to make adorable picture frames to hold our new fun photos! Thank you Brenda for all you did to make March a wonderful month! February was filled with love. 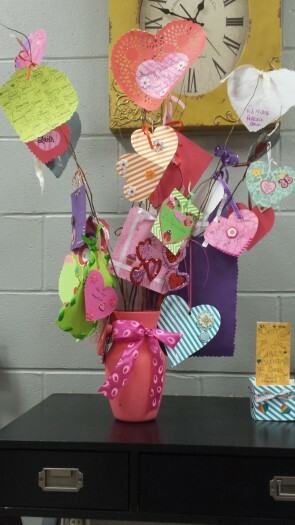 This month we made valentines and bookmarks to decorate a tree of love and gratitude. 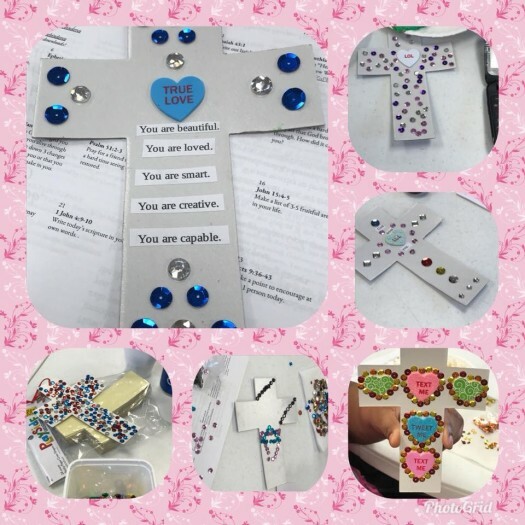 The women really enjoyed making both the valentines and the bookmarks. They as always were very creative in how they made them. 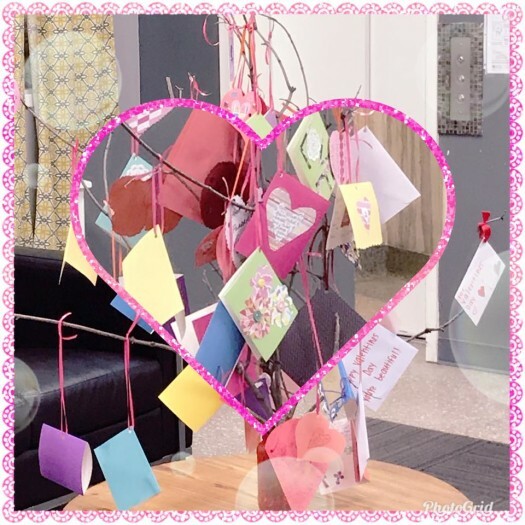 By the end of our time there our little Chicktime tree was overflowing with valentines. We leave the tree on a table in the lobby so that any woman can come by and pick up a valentine so they can feel loved. Our goal is that all the women can feel loved on Valentine’s Day and it is always a huge hit! What a crazy start to the new year! 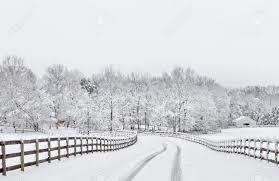 Indy was hit with a ton of snow and freezing cold weather. The week we went to volunteer, we were the first volunteers that they had seen all week! I know they were glad to see us… The number of women and children staying at the Center was up. With the weather no one was really getting out and about. They had even lost power early on in the week. The women were ready for a distraction! 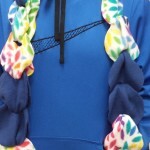 This month we made fleece scarves! It is the cutest pattern that Carol found and the women just love! They all got to pick out one to two differt colors or patterns of fleece to make their scarves. I know the women had a great time making the scarves and with the continued cold weather I am sure they are putting them to good use! It was also exciting because we continue to have new volunteers come to join us every month. 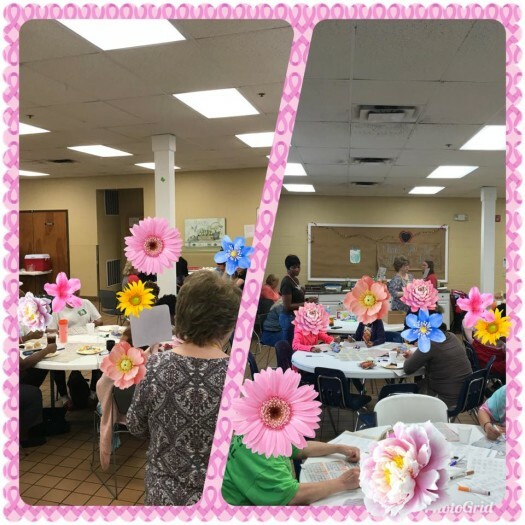 It is such a blessing to continue to see both new and old volunteers coming together to add joy to the lives of the women at the Center. Every month I get to hear about how much our being there means to them. Together we are making a difference in the lives of these women! Thank you so much to all of the volunteers and I hope to continue to see you every month! Wow… December was an interesting month!! 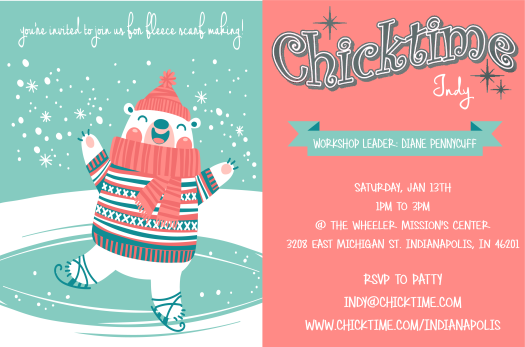 I want to thank everyone who could make it out to join us for December’s Chicktime event with the crazy weather. I know that it really means a lot to the women at the Center that we are there every month. They have come to depend on seeing us, as we may be the only visitors they have that month. I completely understand that everyone has a lot going on in their lives and may not be able to make it every month and that is ok. Just try to make it out as much as you can because it really means the world to these women that we are there. I am excited to say also that we are continuing to get new volunteers!! We are sooo excited to have all of our new volunteers and hope that you will continue to join us every month!! Thank you to Samantha and Carol for being this month’s Chick Leaders! They both did a wonderful job! This month we enjoyed making dougnuts into reindeer and snowmen faces. 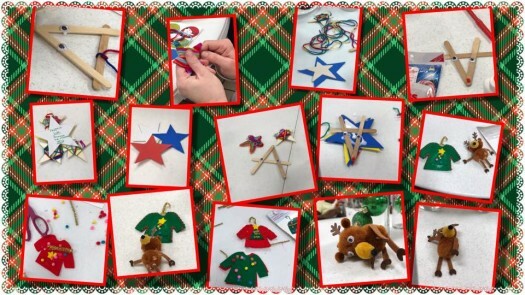 We also learned how to turn candy canes into adorable reindeer! The ladies also enjoyed making beaded candy canes. 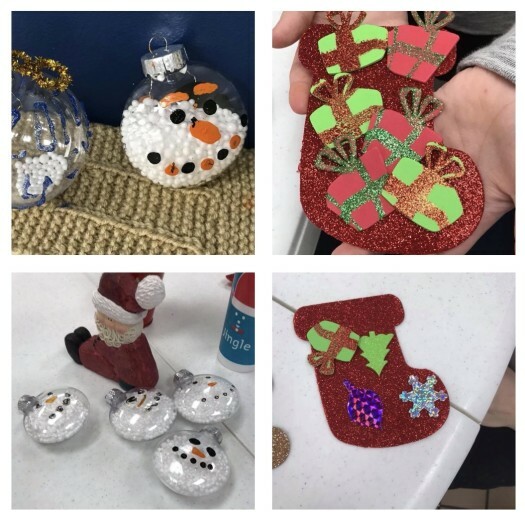 Carol taught everyone how to sew yo-yos and make them into beautiful ornaments! 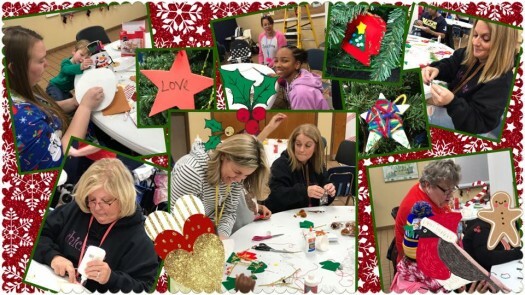 The women picked out fabric, buttons, and bows and made beautiful christmas trees, candy canes, and snowmen! I am always highly impressed at how talanted all the women are! 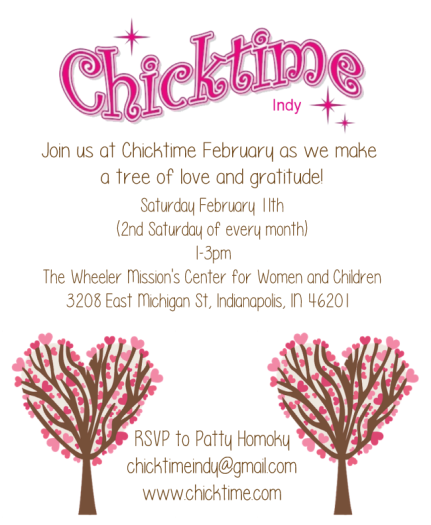 Thank you to everyone for making Chicktime Indy such a wonderful chapter. Without all the hard work of our volunteers we would never be where we are today. I hope everyone has a wonderful holiday season filled with joy! I can’t wait to see you all in the new year! Wow! 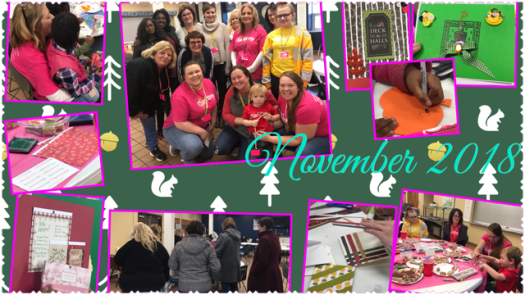 What a great month November was for Chicktime Indy! This month we made fabric pumpkins. They are such cute fall decorations! Every one that was made had it’s own style. I am always amazed at the women at The Center and what they do with whatever we have planned. They are so creative and extremely talented! This month was also great because we had so many new volunteers! This is very exciting for us and we are so happy for such a wonderful blessing. If you have been unable to join us up until now, please know that we would love to have you. Every month we hear from the women at The Center how much it means to them that we come every month. They look forward to seeing us each month. And I know that we always have a great time. We also had our first “Chicktime Chat” this month. We are going to start having Chicktime Chat’s once a quarter. 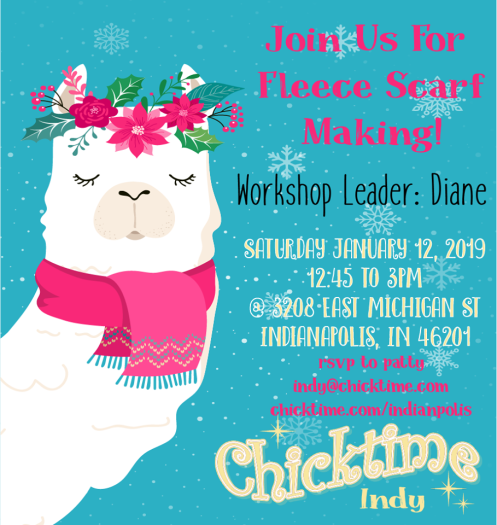 This will be a time where if you have been thinking about joining Chicktime Indy but would like to come and talk about it and meet some of the other volunteers you will be able to do so. At this Chicktime Chat we sat down and planned out our monthly activities for 2014. If there is a month you would like to lead just let us know and we can see what we can do to make that happen. This month we teamed up with another volunteer from Wheeler. Anna is a professional photographer and had volunteered to take pictures of the women. We spent longer than usual volunteering this month in order to help out. We spent hours helping multiple women prepare to get their pictures taken. We did this by helping to style their hair and help with their makeup. Everyone had a great time and I can’t wait to see all of the beautiful pictures! 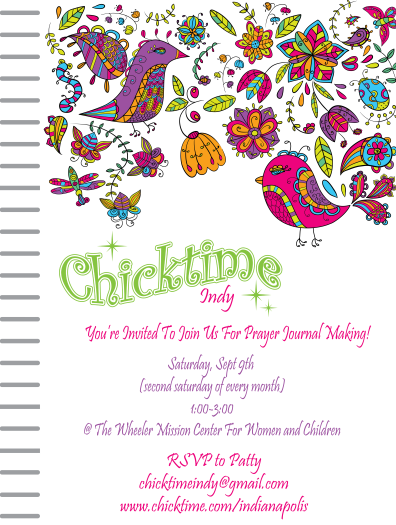 For our Chicktime event in September. Pam Robbins was our fearless Chick Leader. She brought to the table her wonderful talent of beautiful makeup looks. In September she showed all the ladies how to do a new eye makeup look. I know everyone had a great time and loved the new looks! Wow… this summer has just flown by. I want to apologize that I have not updated the page in awhile, sometimes life just gets away from you. Needless to say Chicktime has had three great months this summer. In June, D”Lee was our Chick Leader and she brought her dance instructor, Monique, with her. Together they taught us many different dances. We learned the macarena, the maranga, the cha cha, and one of the little girls at the center taught us all the wobble. Everyone had a great time learning the new dances! Thank you to D’Lee and Monique for teaching us these dances! Also in June we were able to give a new wheel chair to a woman in need. I know that this meant a lot to her. I would like to thank CHHC for their wonderful donation. I am sad to say that I missed July. I was away for work but that did not stop Chicktime from going on. 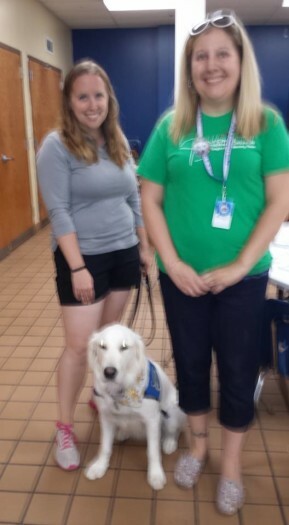 In July, Heather and Dawn were our Chick Leaders. This month they showed the women how to paint jars to look like they were made out of sea glass. I know everyone had a great time decorating their jars. I’m sure they all turned out beautifully! Thank you to Heather and Dawn for leading the month of July. 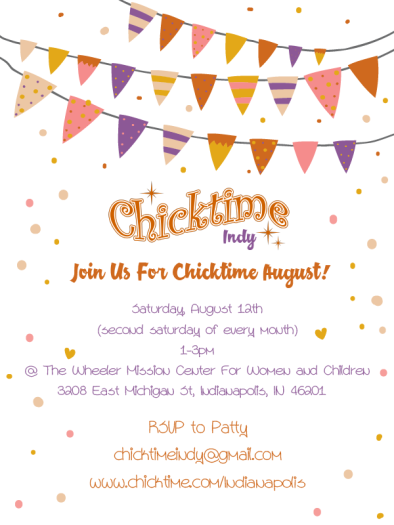 For August we brought back an activity from our first Chicktime event ever. We made tote bags out of old t-shirts. The women love this activity and each tote bag is made to be their own. We all made some sweet treats in the microwave. We used coffee mugs to bake either brownies, chocolate cake, or peanut butter cake in the microwave. It was a fun and easy desert to make and they tasted great! If you have looked at the website and are wondering still about if Chicktime is right for you, I think you should give it a try. Every month the women at The Center for Women and Children are so happy to see us. They love any activites that we do and always appreciate that we are there. We get the opportunity to spread love and compassion to those that need it most every month. There is nothing more rewarding than that! Chicktime May was tons of fun! Brenda Jackson helped us to decorate flower pots. Some were done with paint and other mod podged with tissue paper. All of the flower pots turned out adorable! After each woman was done decorating her pot she got to plant a beautiful flower in it. Some of the women kept their flowers and others made cute tags or cards so they could give them as a gift for Mother’s Day. Thank you Brenda for such a fun month! I know that everyone loved it! Also, we had a garage sale as a fund raiser the same day as Chicktime. We had great results that will allow us to purchase devotionals and t-shirts for all of the ladies at the Center! I know that will be excited. Thank you to everyone who donated items to the garage sale! Without you we wouldn’t have been so successful! We will be doing another garage sale on June 1st. If you have any items you would like to donate please let me know so we can set up a time to meet before the next garage sale. All donations will be appreciated. You can also come out and help us sell that day if you would like. This is a great way that we can get Chicktime’s name out in our community! Make sure to mark your calendars for June 8th. D’Lee Baugh will be our Chick Leader for June. D’Lee loves to dance, so she will be teaching us some different dances! So put on your dancing shoes and join us in June! 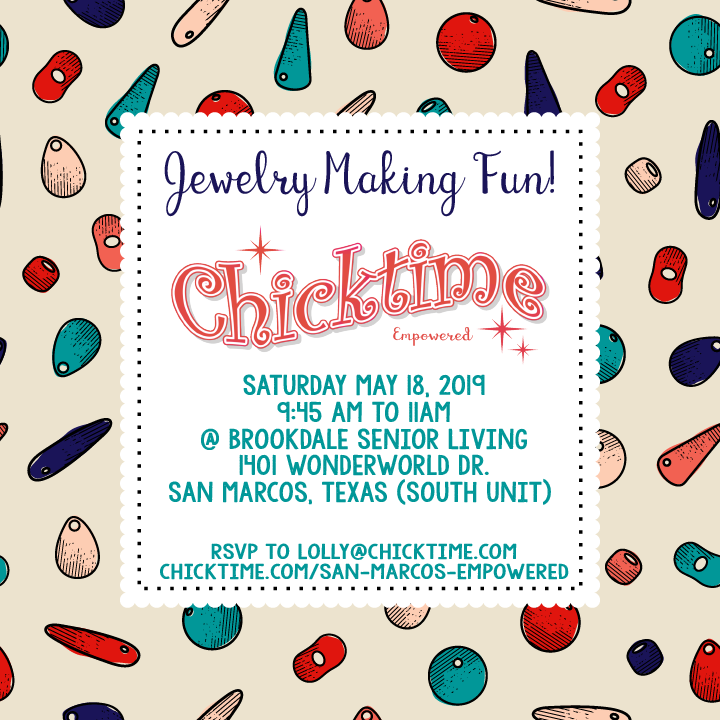 April’s Chicktime was a great time! If you weren’t able to make it, make sure to mark your calendars for the second Saturday of the upcoming months. This month Dawn Homoky was our Chick Leader. 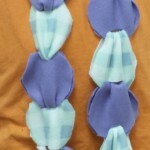 She planned an activity of making bookmarks and necklaces out of plastic canvas. 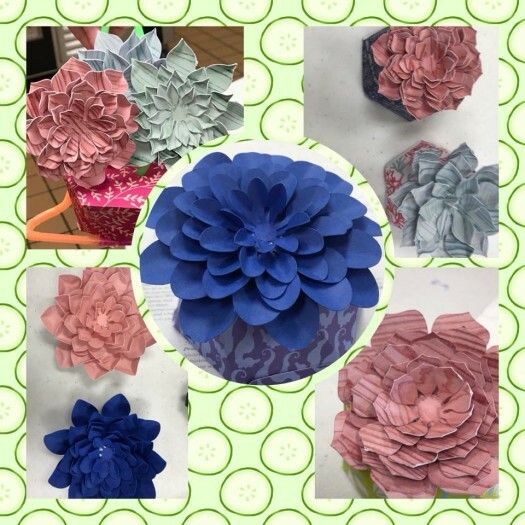 This activity was a challenge for all, lol; although we did make it through with some beautiful finished products! Challenging or not, the women always love to see us and enjoy the activities that we have planned! Because of the nice spring weather we have been having we had less women than last month. Also, some of the women will be moving on in the program. These women hope to come back and join us as volunteers once they have completed the program! I think that shows just how much us coming means to each and everyone of the women! I hope to see you all next month as Brenda Jackson will be taking the lead as May’s Chick Leader. She is going to have us getting a little dirty planting flowers. I can’t think of a better spring activity. So mark your calendars for Saturday, May 11th! 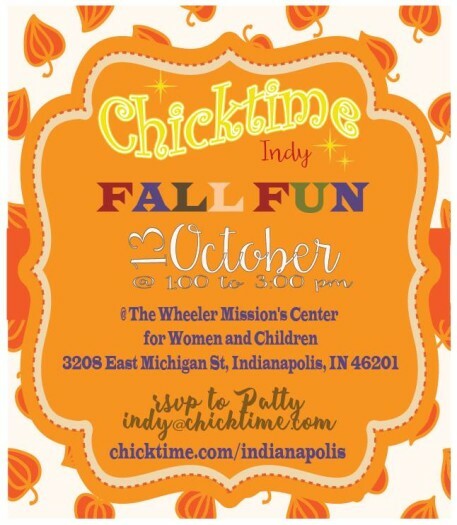 Great news for Chicktime Indy… We now have a Facebook page up and going! 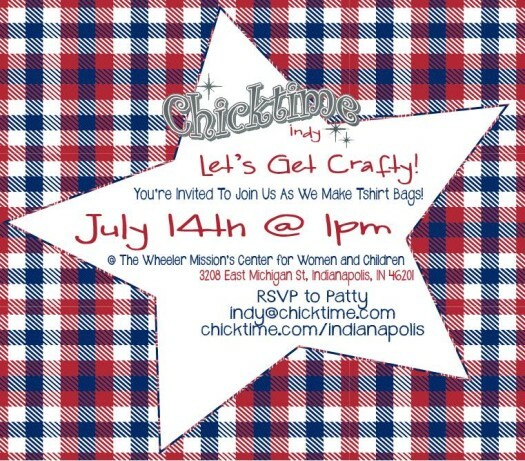 We would love if you would like the Chicktime Indy page on Facebook. Also, feel free to post comments or questions you may have on the page! Wow! Chicktime was great this month! We had our largest turnout yet of the ladies from the Center for Women and Children! This month we had over 30 women. Chicktime is something that the women now look forward to each month and they can’t wait for us to come back! This month we made beautiful pearl braclets based on the colors of Easter. It was all based around a sermon that I had found online that told the story of Easter and what each color means to the Resurrection. The women also all got the new Chicktime Devotionals. They were so excited! 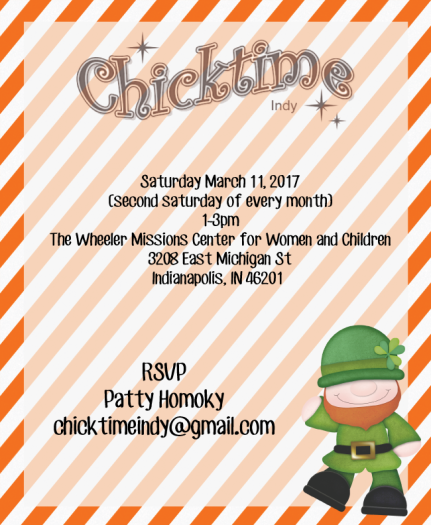 Thank you again to all of the volunteers that come each and every month, without you Chicktime Indy would not be possible! You are all absolutely the best! 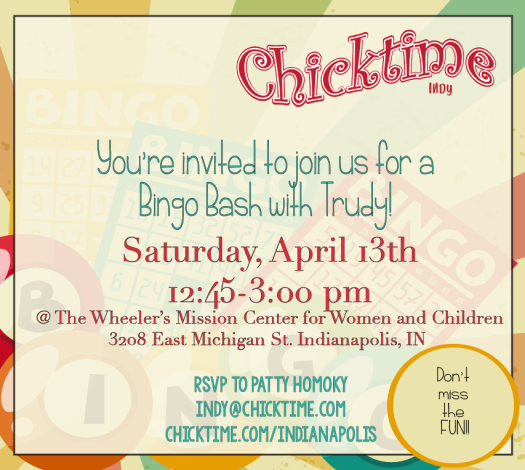 With that being said, if you haven’t been able to make it to Chicktime yet, please come and join us on April 13, 2013. With the growing number of ladies attending we need your help. I promise it is a good time for everyone involved! See you next month! Thank you Sam for making so many different kinds of wonderful cupcakes for us to decorate! I know that the women enjoyed decorating the cupcakes with all the fun decorations and toppings that you brought. It’s always nice to have a sweet treat! 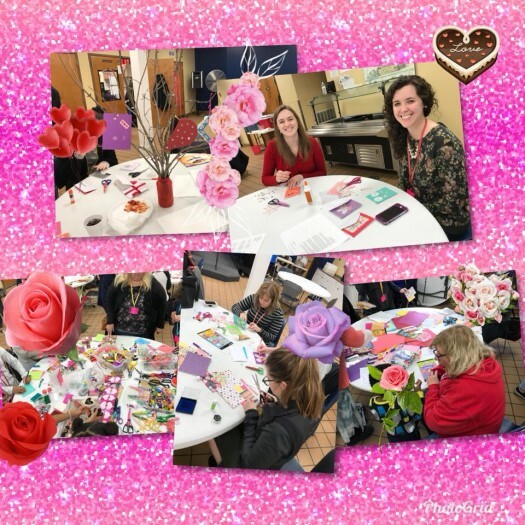 The women also enjoyed making Valentines. 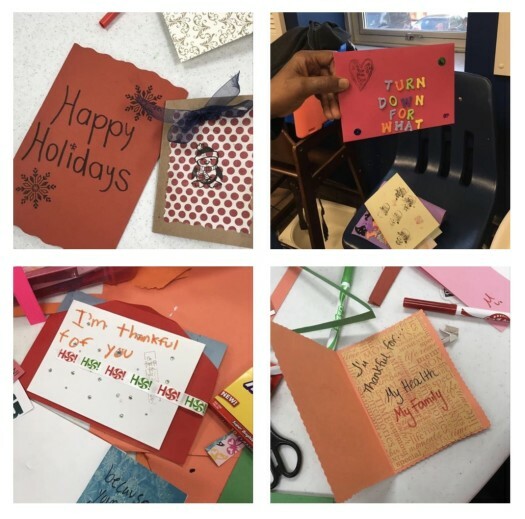 They were asked to make Valentines to decorate our tree of love and gratitude, but they could also make Valentines for anyone they wanted to. 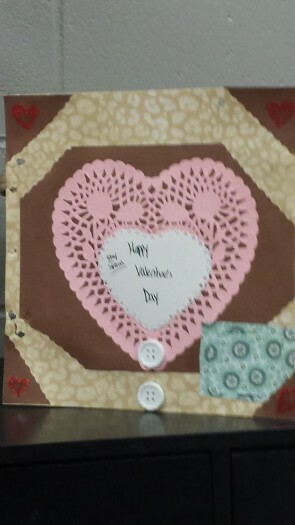 The women at the Center for Women and Children are extremely creative and made some beautiful Valentines! 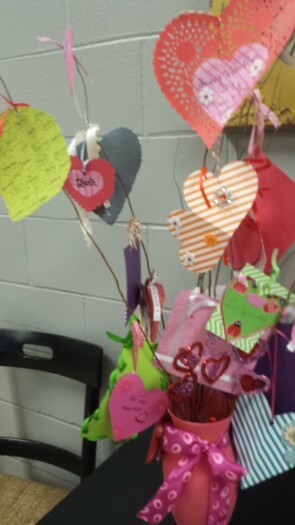 ​The Valentines that they made for the tree of love and gratitude were made so that any women at The Center could pick up a Valentine and feel special and loved. 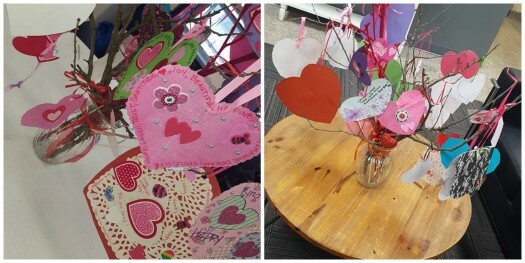 The tree quickly went from some bare tree branches to completely covered with inspiring Valentines! We left the tree of love and gratitude in The Center’s lobby so that all the women and children could enjoy the tree. 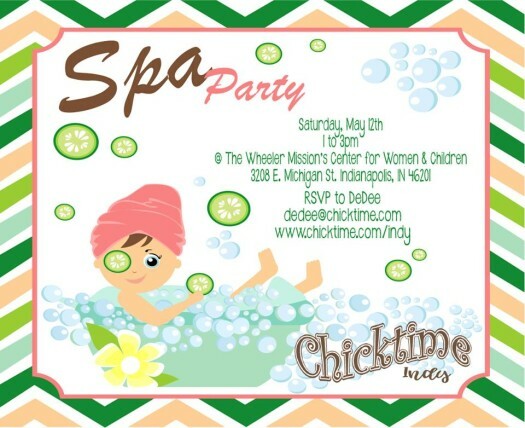 Chicktime Indy was again a great success! The only reason we are so successful is because of all the wonderful volunteers that give their time every month! 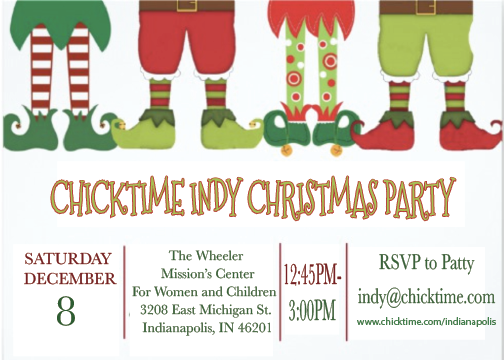 Thank you to all of our volunteers, without you Chicktime Indy would not be possible! 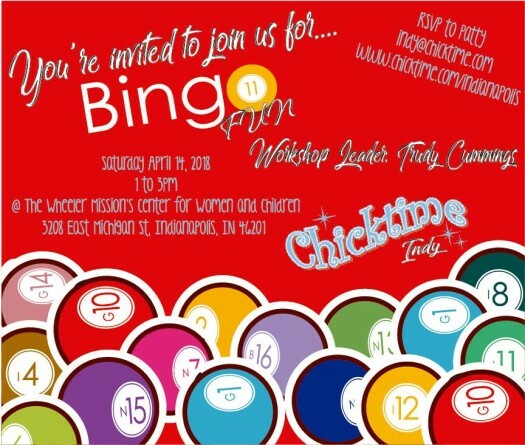 Make sure to mark your calendars for next month’s Chicktime event, Saturday, March 9, 2013 from 1 PM to 3 PM, I know you don’t want to miss another month! 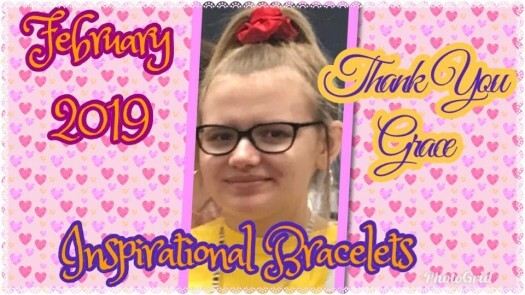 January was a huge success! This month Carol was our Chick Leader. 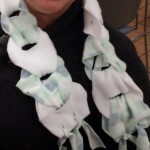 She showed us how to make the most adorable fleece scarves! 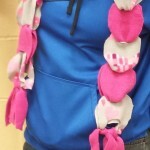 The scarves were a huge hit with both the women and children. 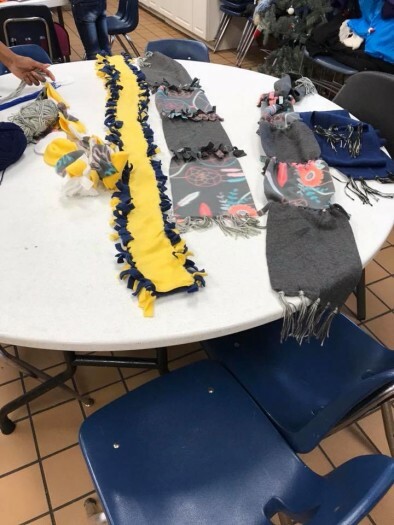 It was a bit ironic that we were making scarves and it was sixty degrees outside. You just never know with Indiana weather. 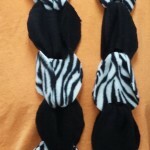 I know that the women and children are loving having their new scarves now that it is cold out again! Thank you for leading such a wonderful activity Carol! And thank you to all of our wonderful volunteers that continue to come every month! This month we just so happened to have luck on our side. Normally when we arrive no one is in the cafeteria and everyone slowly comes in to join us. This month was different the mother’s with children had been to breakfast with Santa that morning so they all happened to still be eating lunch when we got there. As they finished eating the children began to come and join us, soon followed by their mothers. Karen was the Chick Leader this month and she did a great job! She had plenty of fun Christmas activites for us to do. Everyone had a great time decorating sugar cookies! The kids got a little messy, but that’s part of the fun. 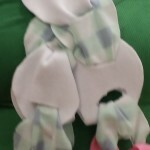 We also learned how to make wreaths out of old sweaters and they were adorable! She also had us make some really cute snowmen ornaments! This month I noticed a lot of wonderful things happening. It really touched my heart when a little boy of about seven made multiple sweater wreaths so that he would be able to give them to some of the women at the Center. The cookies that the children decorated, they made for the women that had not come down to join us that were still in their rooms. One young woman in particular took the cookies upstairs to the other women. As she was walking out of the room, I noticed that she was trying to balance three plates of cookies, so I offered to help her. On the elevator ride up, she thanked me for Chicktime being there that day and said how much it had helped to lift her spirits. She told me that four days before her mother had dropped her off. She had been dropped off because she had gotten into a bad relationship and ended up doing drugs. She was there to be a part of the rehab program. She knew it was a good thing that she was there getting help but she had been kind of down about it. Her story is one that made me want to cry but also touched me in a way that I cannot describe. 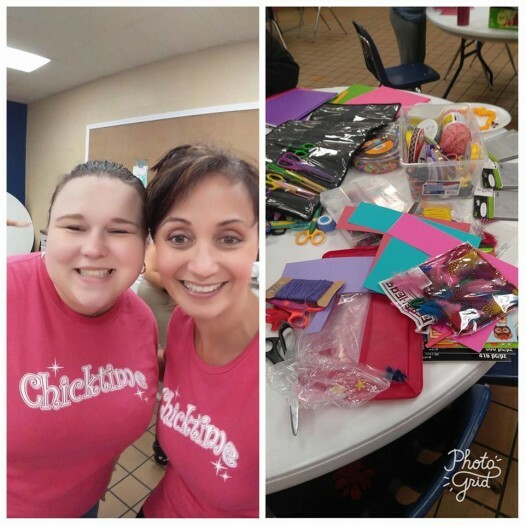 I was happy that Chicktime is helping to give hope and share love with these women and children because that is what Chicktime is all about. 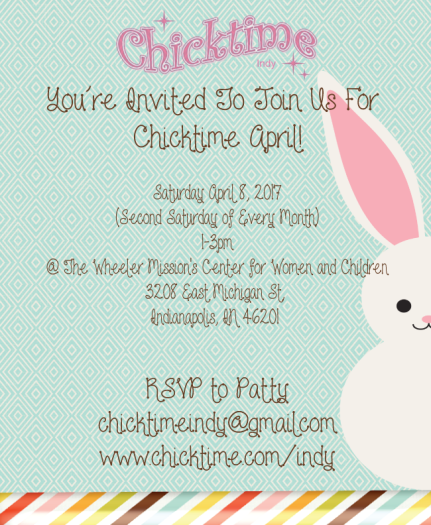 I am so glad that Chicktime Indy is continuing to be successful and I hope that it just continues to grow stronger and larger every month. 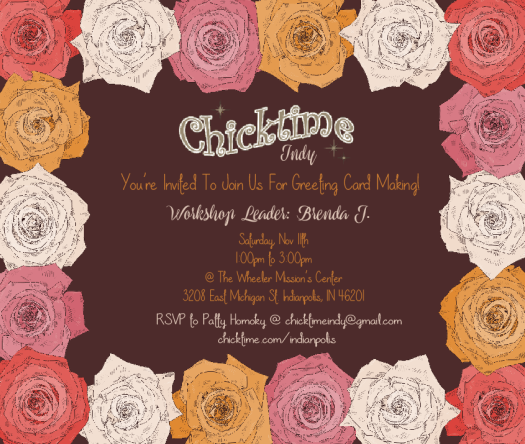 The second month of Chicktime Indy was great! Brenda was our Chick Leader this month and she did a wonderful job! She showed us how to make our own greeting cards. 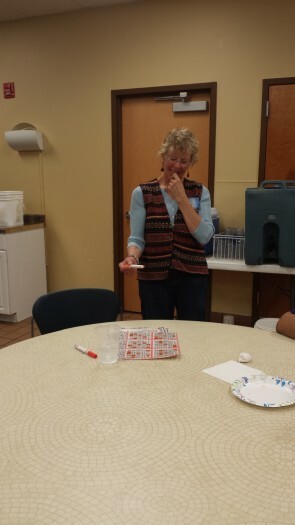 Brenda showed us how to decorate a plain card using things such as stamps, scrapbook paper, and even had us ironing fabric onto our cards. The results were beautiful! 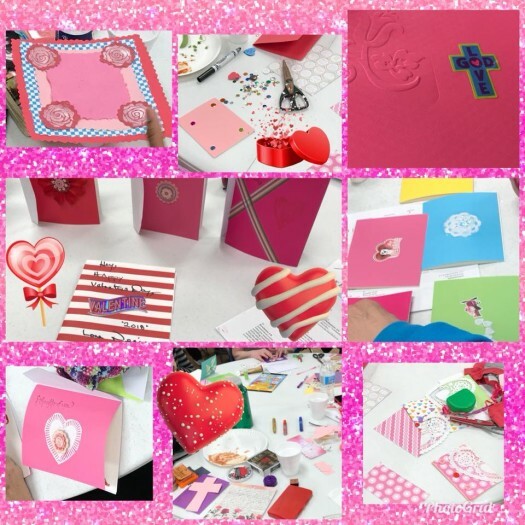 The women loved making the cards! 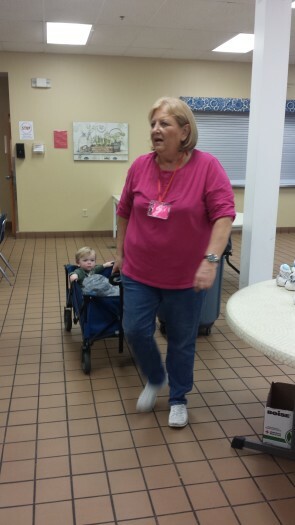 I want to thank Brenda for taking on the role of Chick Leader for November and leading such a wonderful event. 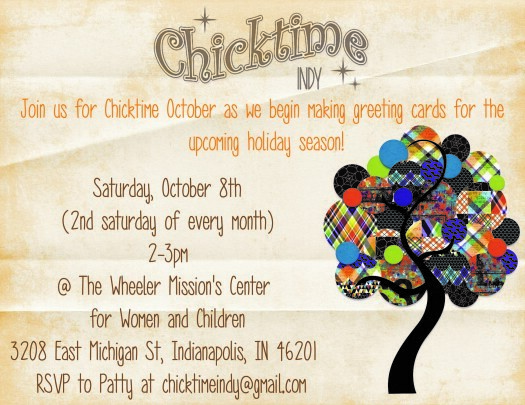 I also want to thank all of the Chicktime volunteers for coming out to enjoy making cards with the women and children. While we were there in November the women began to ask about our cute Chicktime t-shirts and how they could get one. 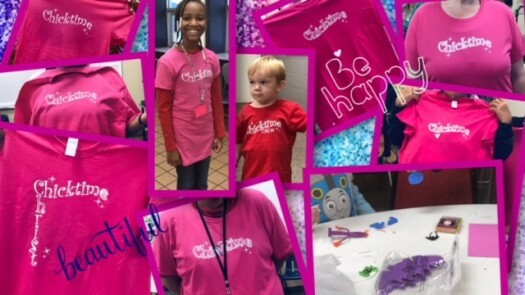 I happened to have the t-shirts with me that day and I couldn’t turn them down, so we started handing out Chicktime t-shirts to the women that were there. If you weren’t there, I wish you could have been because then you would have been able to see just how much one of our t-shirts meant to these women! I would love to be able to continue handing out Chicktime t-shirts to the women, but in order to do so I will need your help. If you would like to help, please let me know. 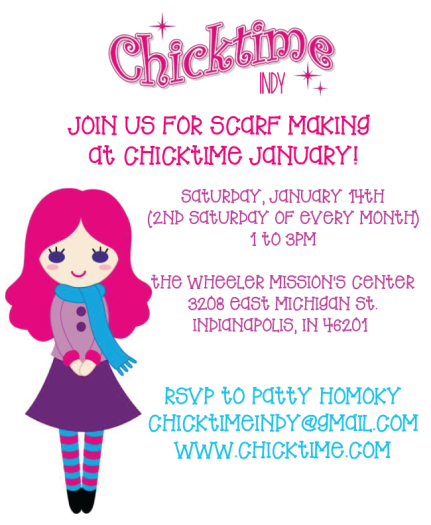 Our first Chicktime Indy event was a great success!! When we arrived at The Center for Women and Children we were greeted with looks of curiosity. The women had seen the flyer inviting them to come and join us but were very curious as to what Chicktime was. At the beginning a few women came in but were unsure about joining us in our activites but were soon extremely excited to be with us after being invited in by our wonderful volunteers. 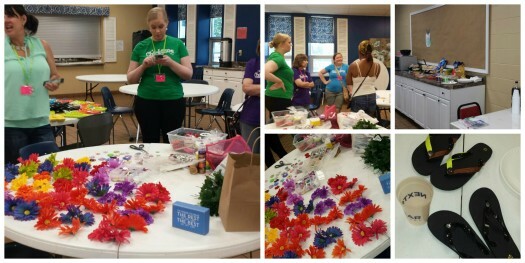 The women loved picking out a t-shirt to make a tote bag and decorating them with flowers that they made and ribbons. They all left with extremely cute tote bags! They were also extremely excited to make the travel size toilietry holders, that they filled with all new toilitries donated by women and local hotels! The women cannot wait for us to come back next month! I know they will spread the word and we will have a larger turn out! Thank you to our wonderful volunteers who came together to make this month a success!! If you weren’t able to make it this month you missed out on a great time! Don’t miss out a a great time next month, come and join us on Saturday, November 10! 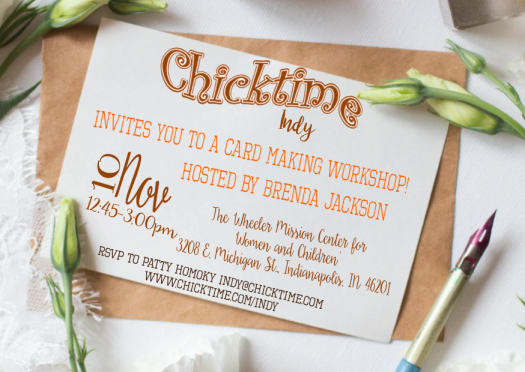 Brenda Jackson will be leading us on the making of holiday cards for every occassion!! After a great Kickoff event, we are all excited to get started working with the women and children! We have the next four months covered but we still need monthly Chick Leaders for most of next year. Sign up to lead a month and come share your passions and gifts! I know that you will love leading a month! Make sure to join us Saturday, October 13 for tons of fun. 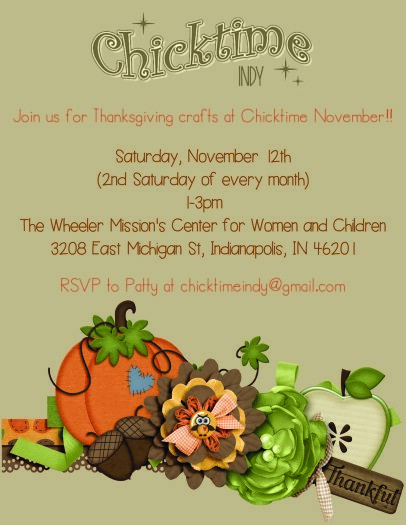 We will be helping the women and children get crafty! 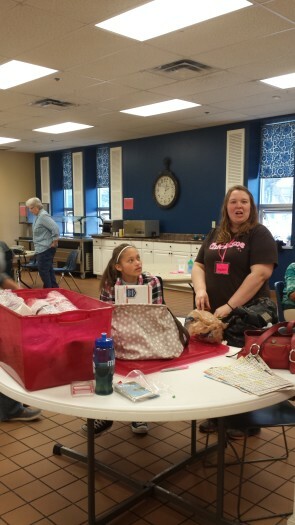 They will have the opportunity to turn an everyday washcloth into a toiletry bag for travel size toiletries! And they will get to join in the current “upcycle” trend by making a tote bag out of an old t-shirt! 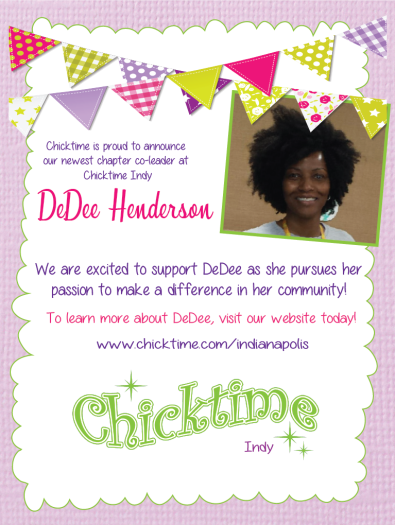 I am very excited to announce that after much waiting, Chicktime Indy now has a place to serve!! We will be partnering with The Wheeler Mission Ministries Center for Women and Children!! 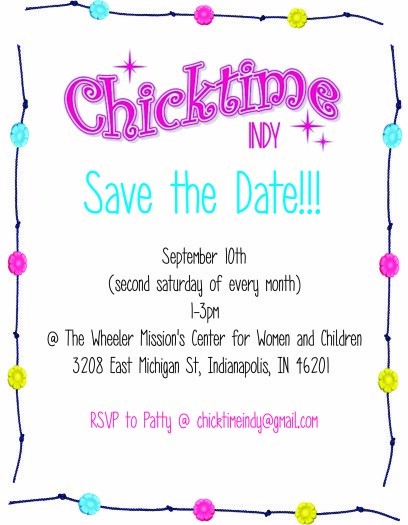 Chicktime Indy will serve the second Saturday of each month from 1PM to 3PM at the Center for Women and Children, starting in October. Please check back for more details on our first month’s activities. We will also be having our Kick-off Party in September. 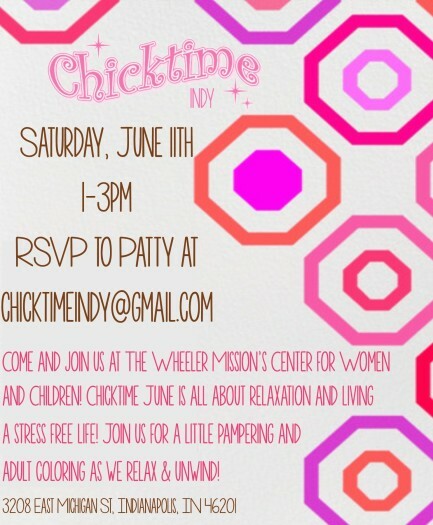 Please join us for fun, food, more information, and a chance to get your Chicktime shirt! Details will be posted soon! Please be thinking ahead because we need monthly Chick Leaders for November and December of this year and also for all of next year! If you are willing to lead a month, please let Patty know. 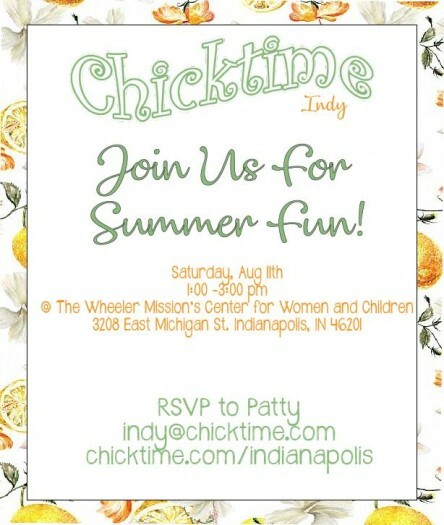 I know that I am very excited that Chicktime Indy is finally taking off and hope that you are excited too! This will be a great opportunity for all of us to serve and have fun at the same time! I can’t wait to meet everyone and serve with all of you. If you have not already, please subscribe to the Chicktime community. That way I can keep you updated through email as well.